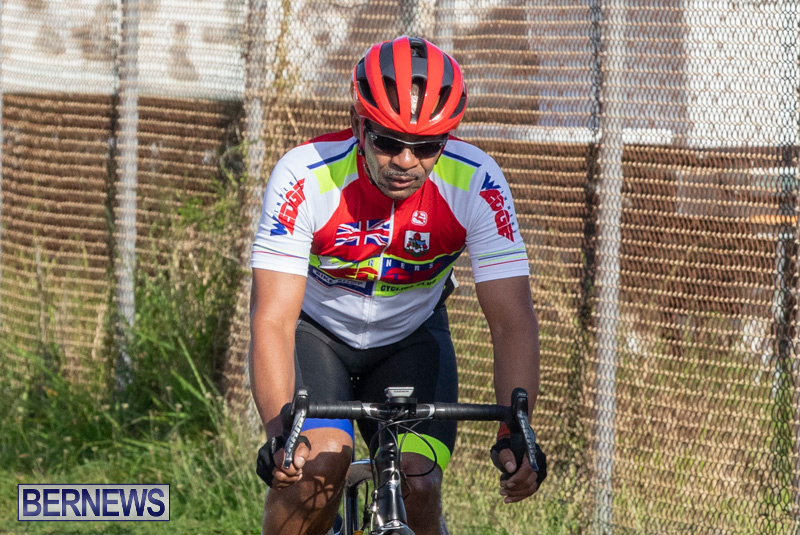 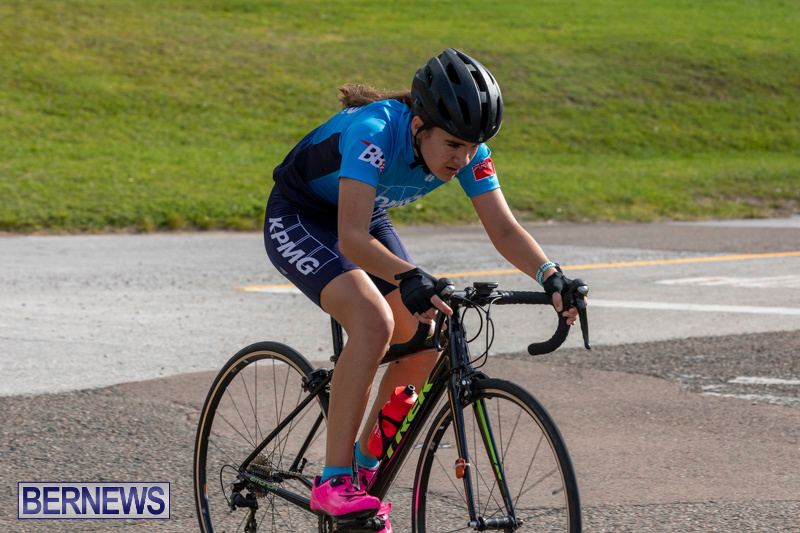 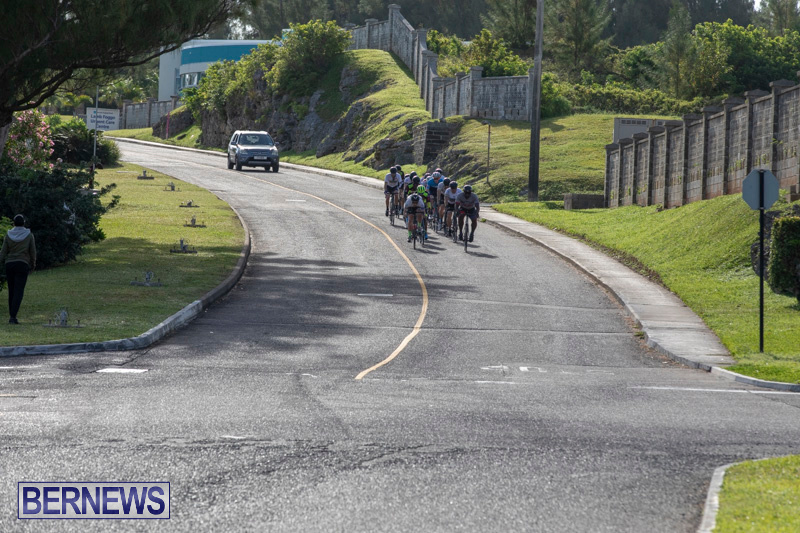 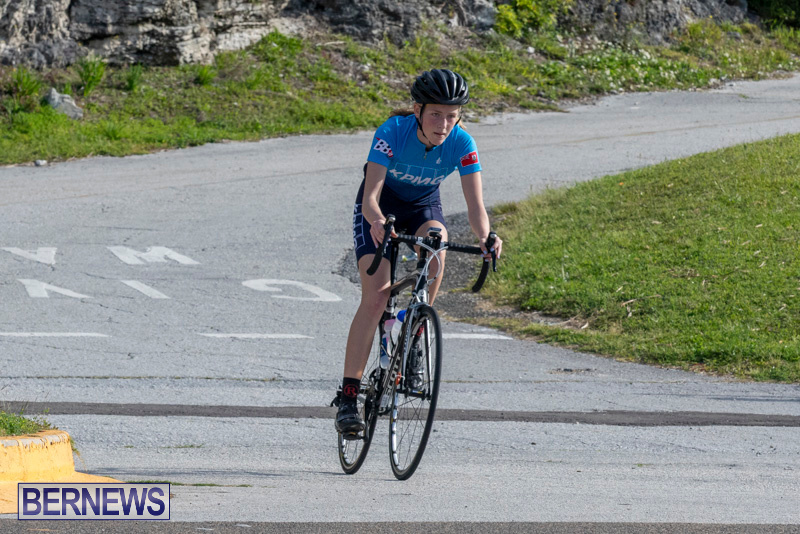 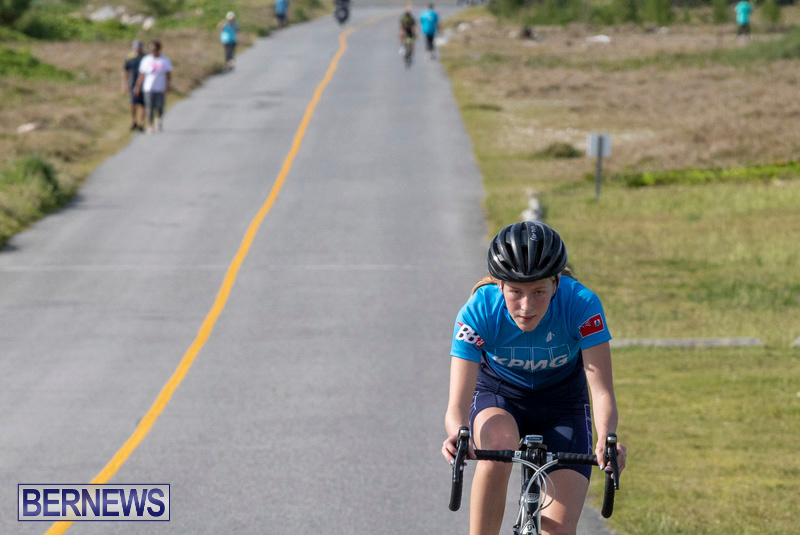 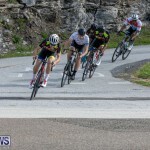 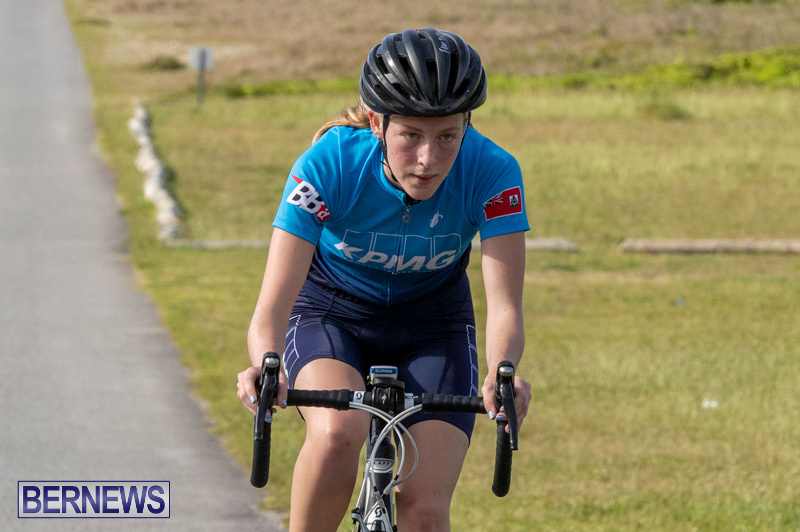 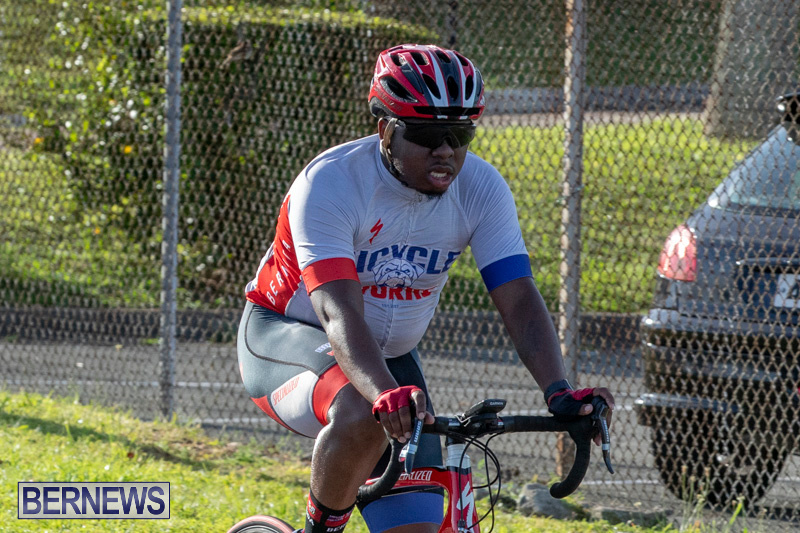 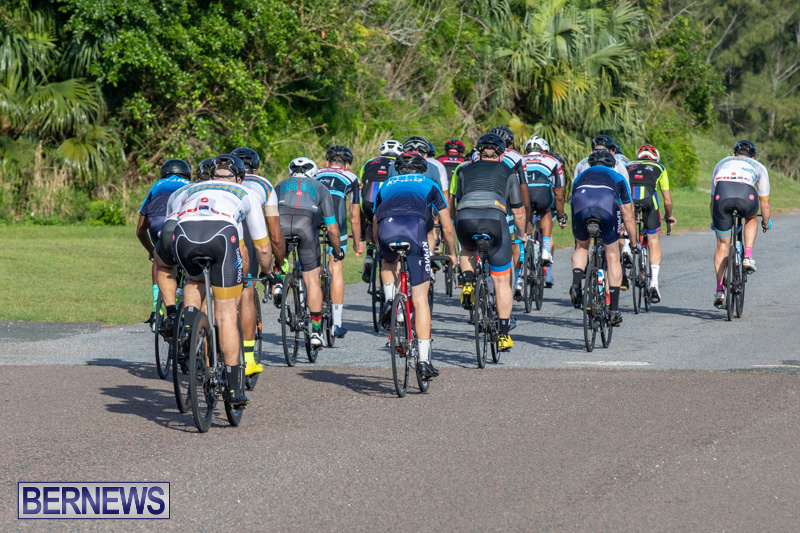 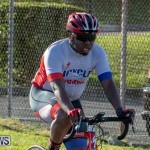 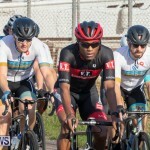 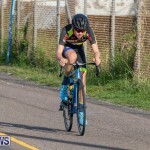 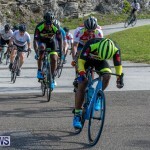 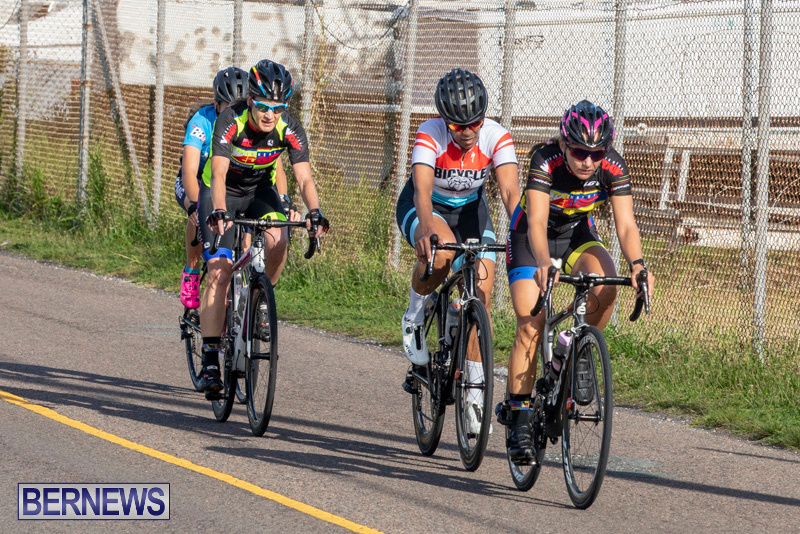 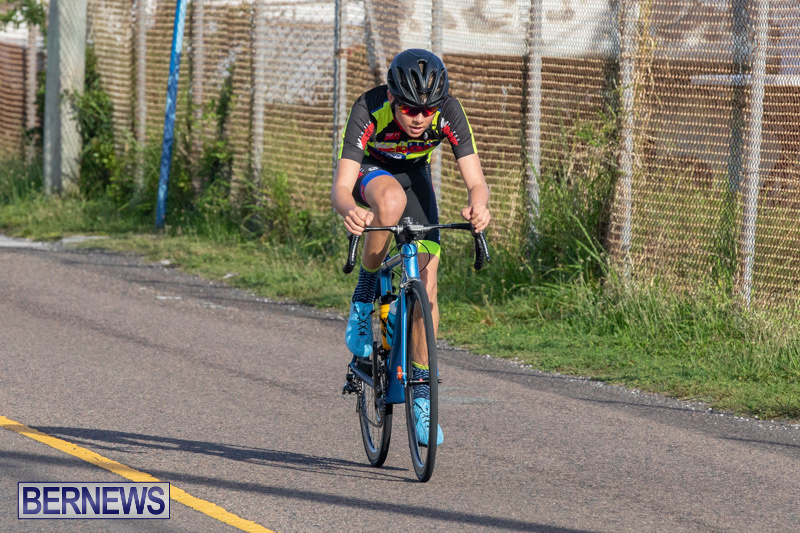 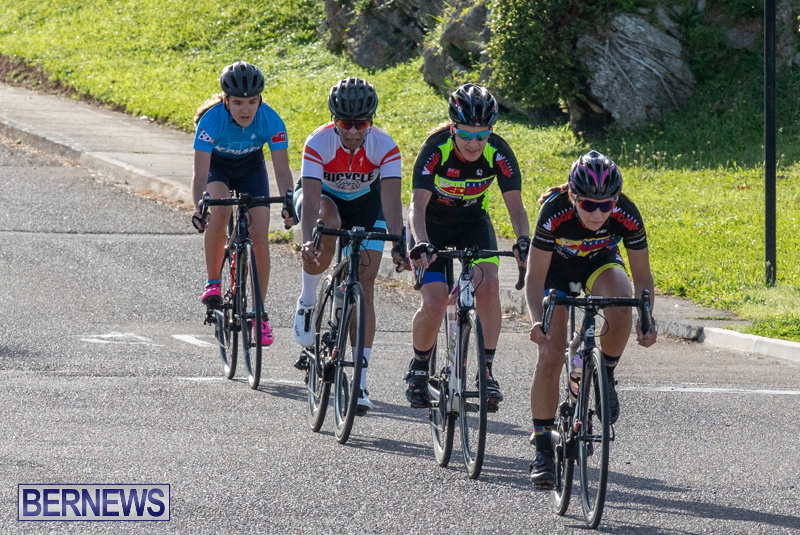 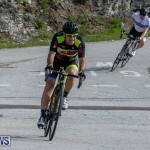 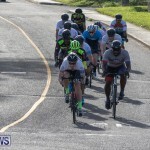 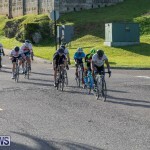 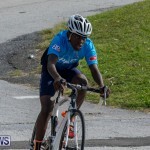 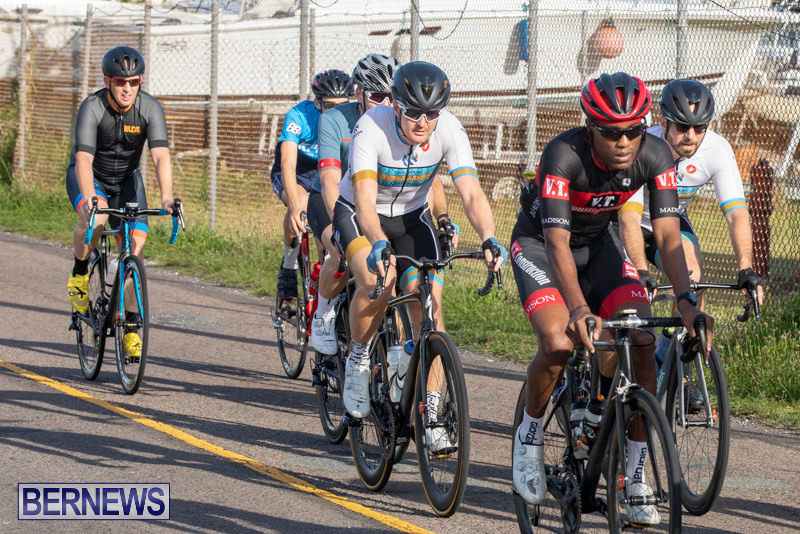 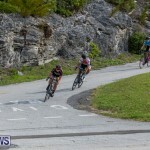 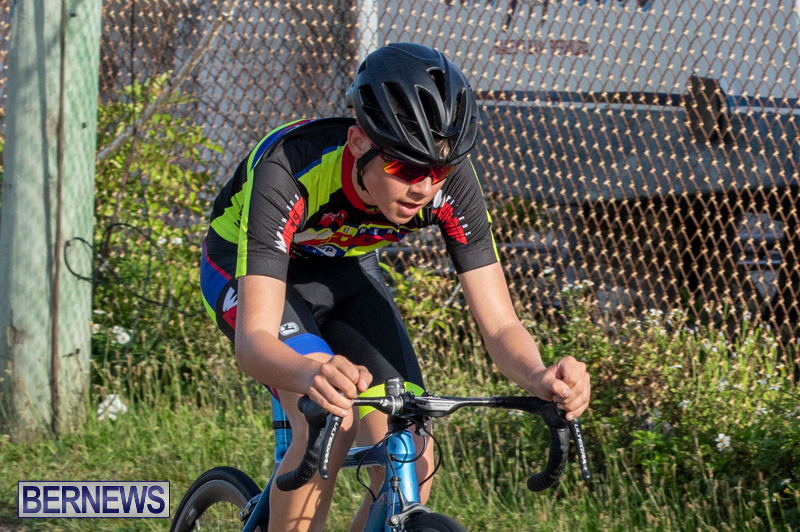 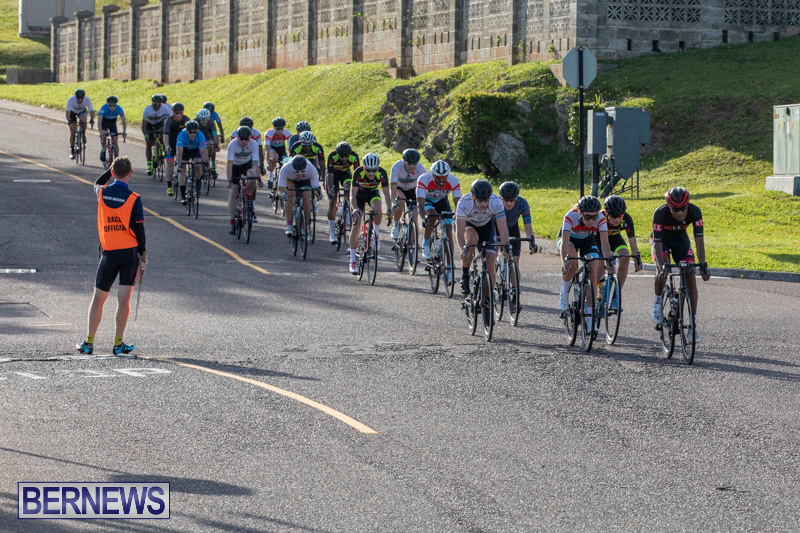 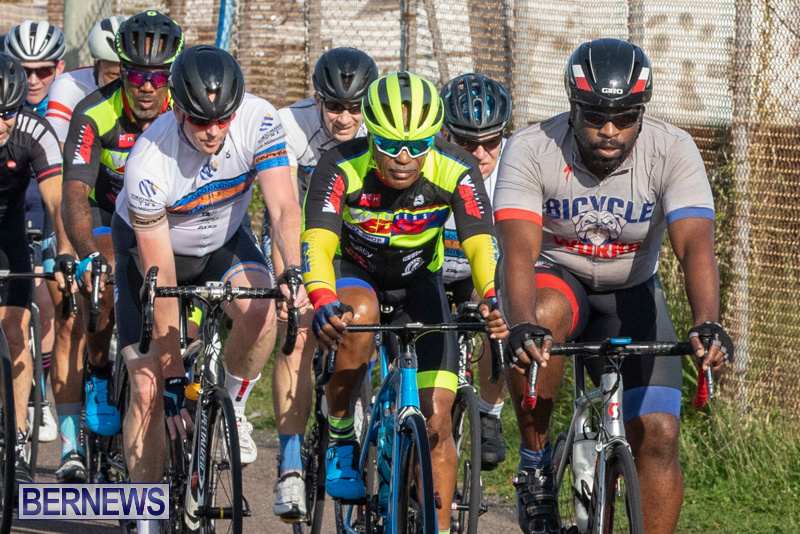 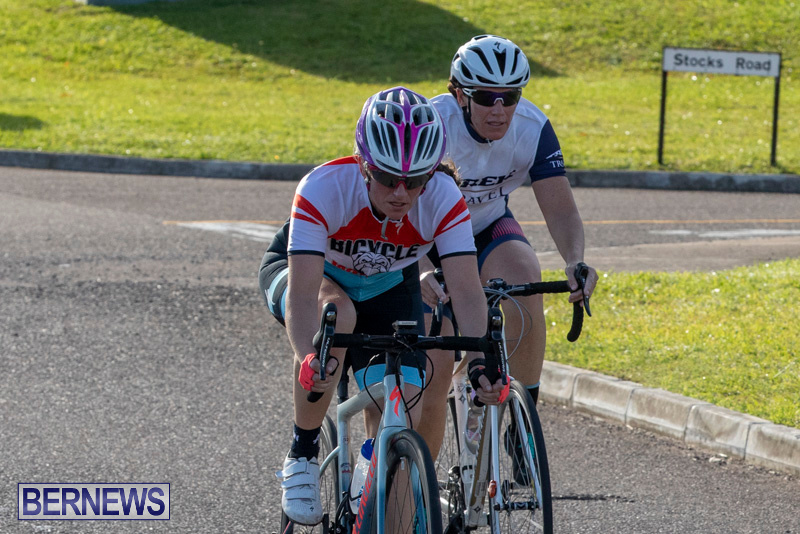 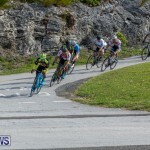 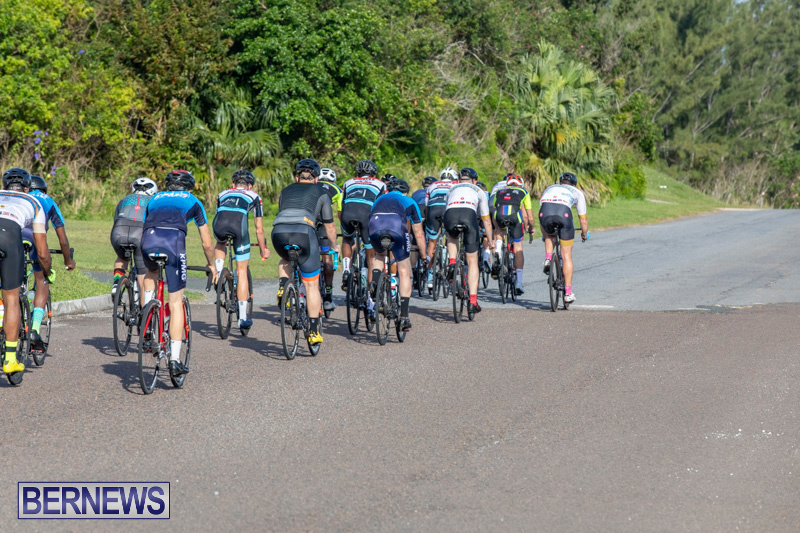 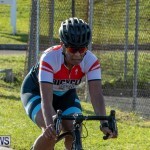 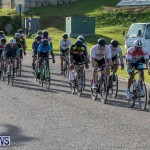 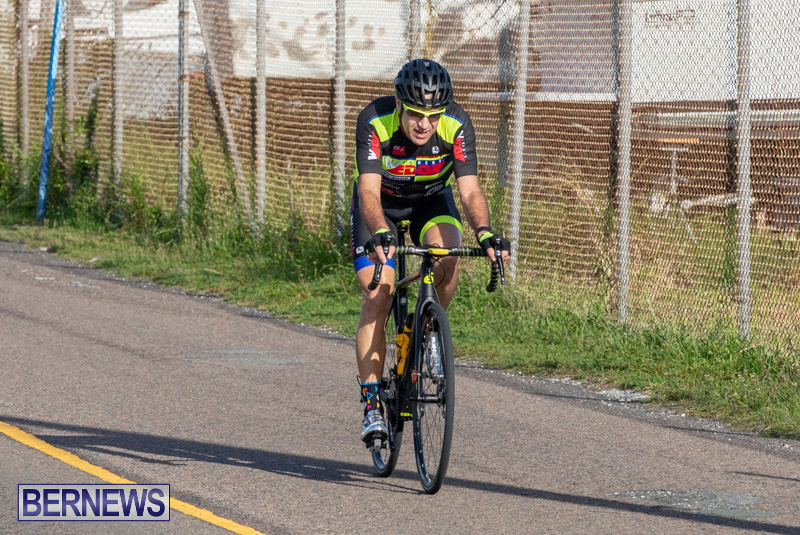 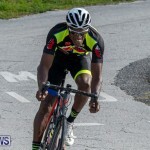 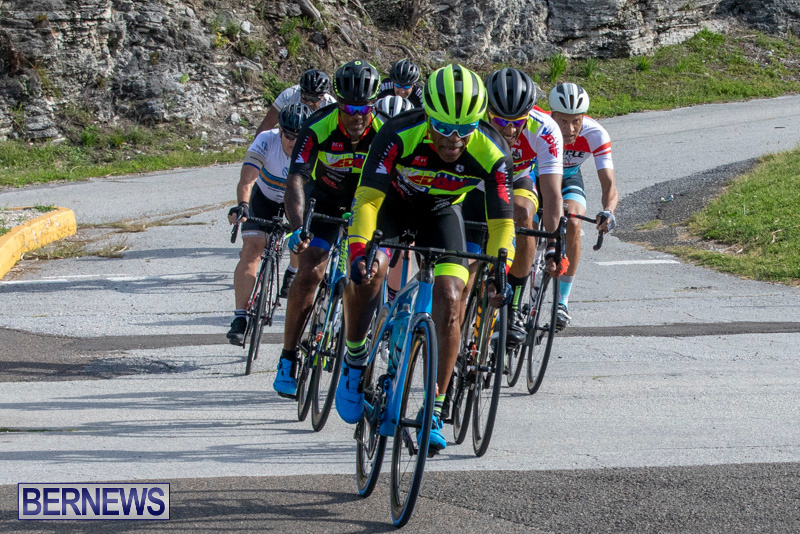 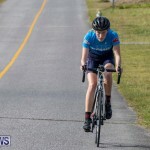 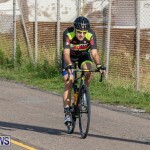 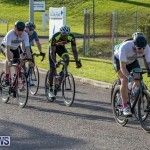 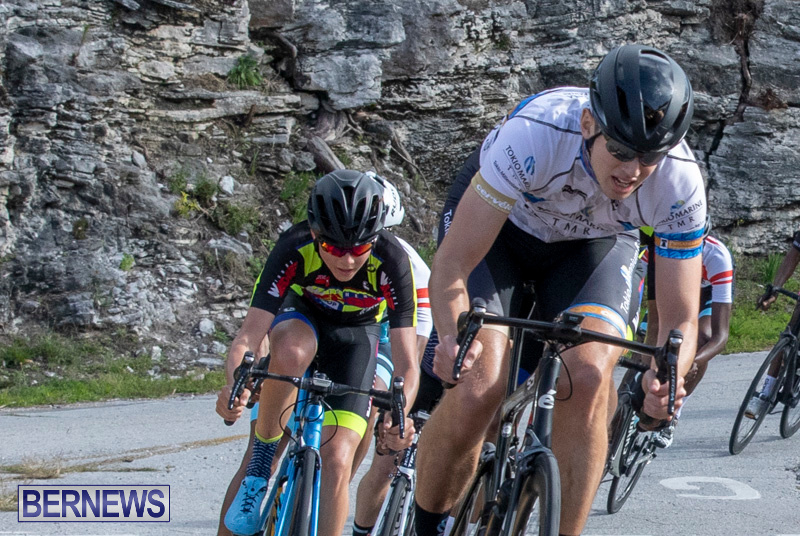 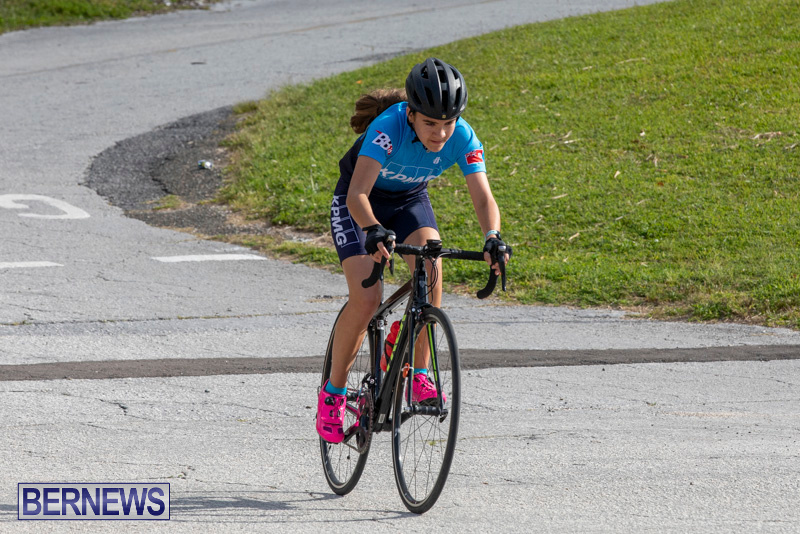 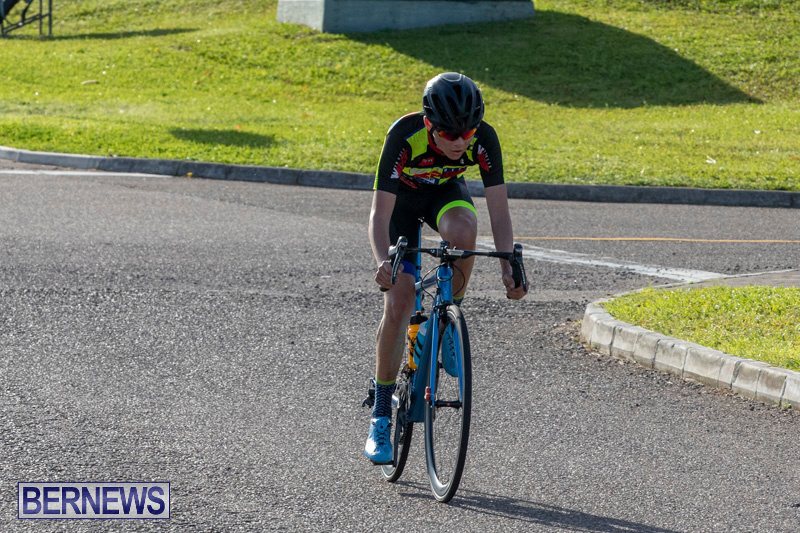 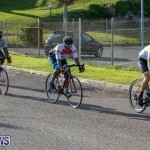 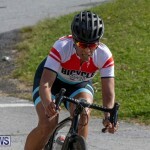 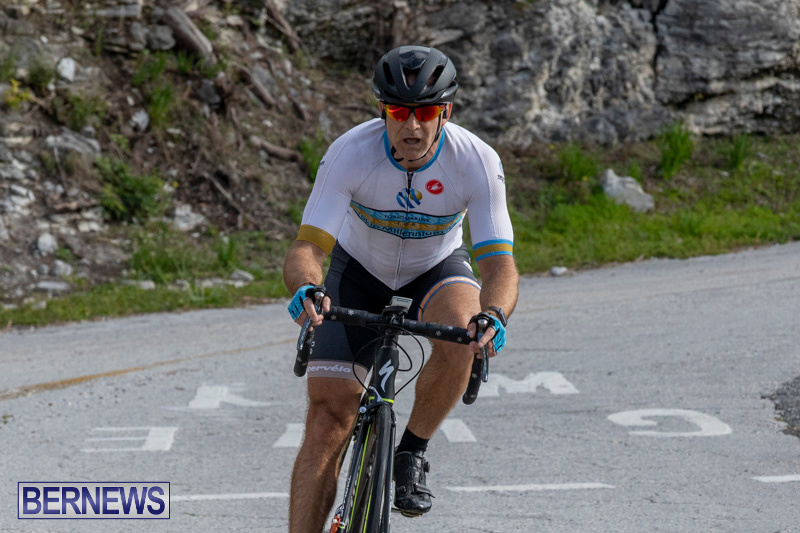 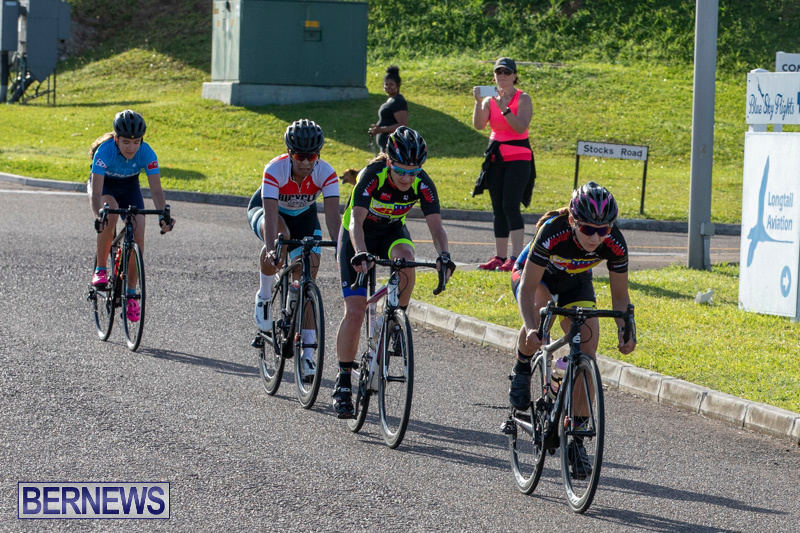 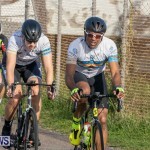 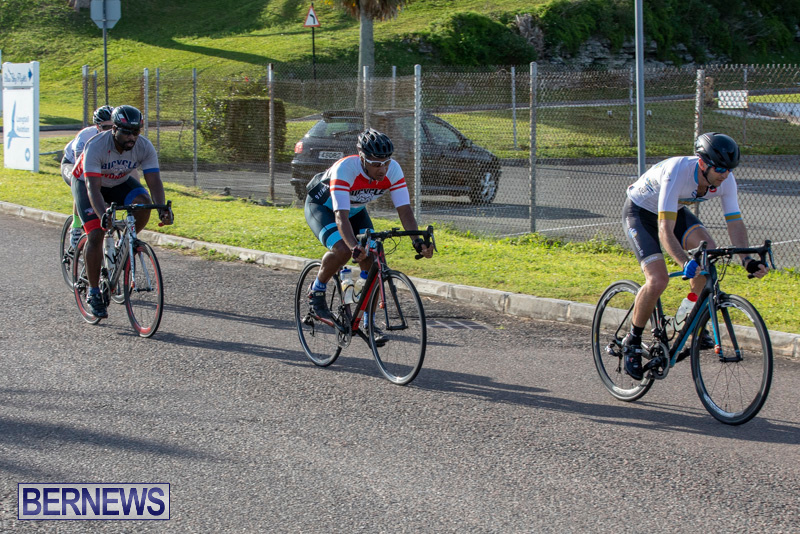 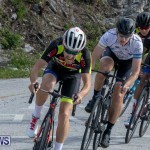 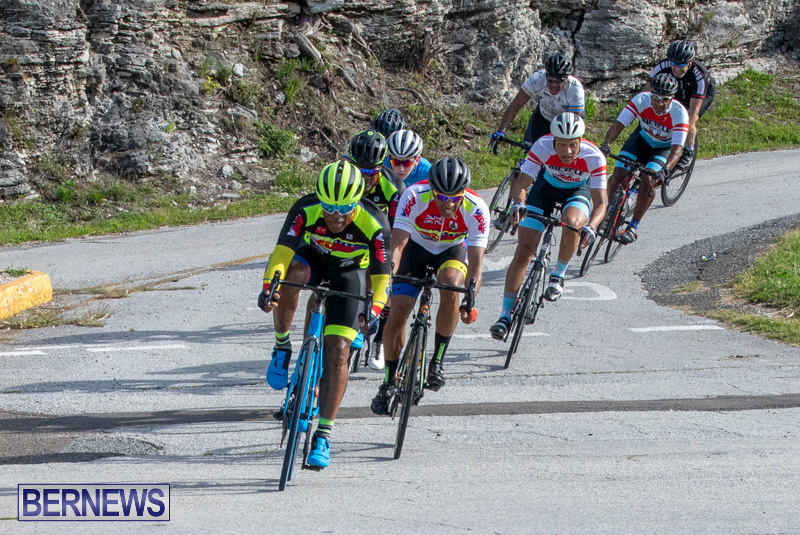 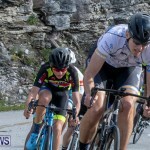 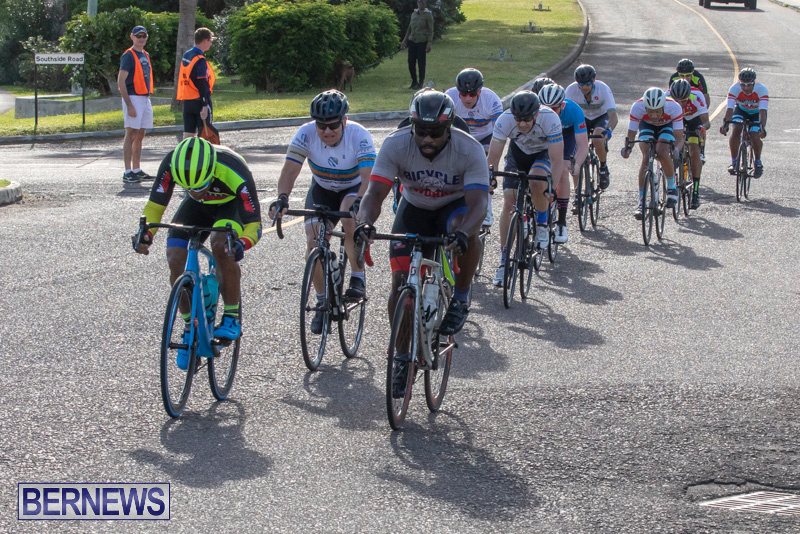 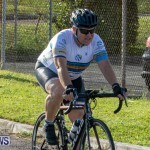 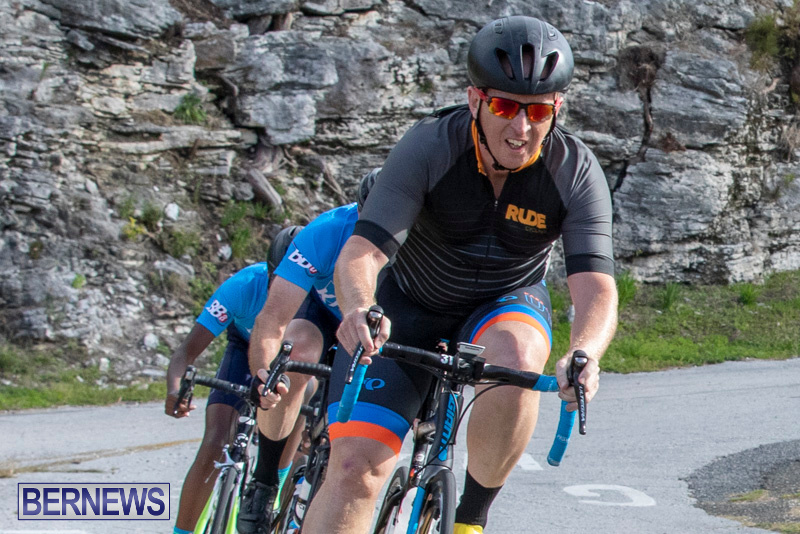 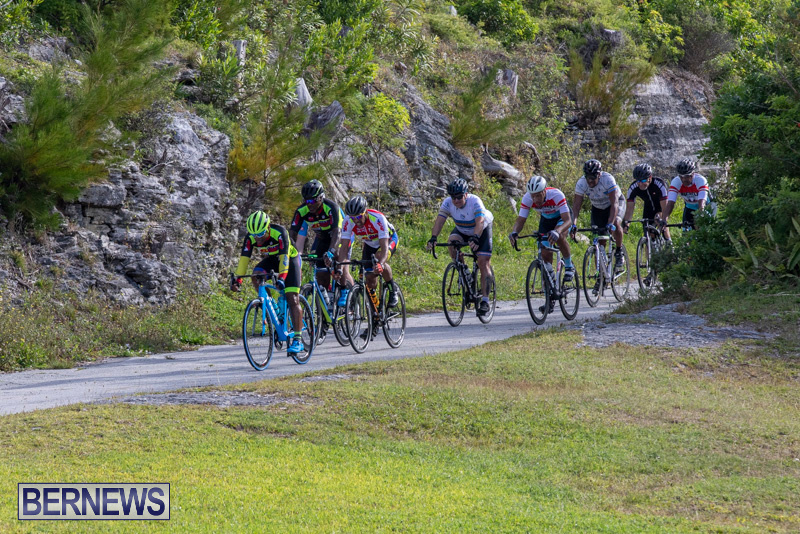 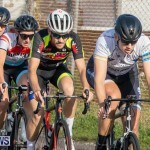 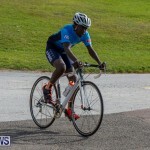 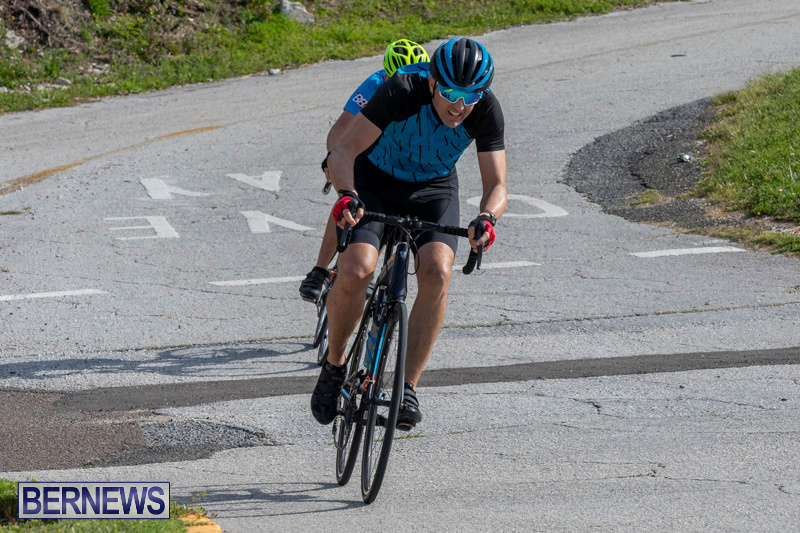 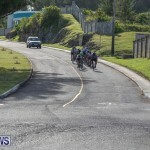 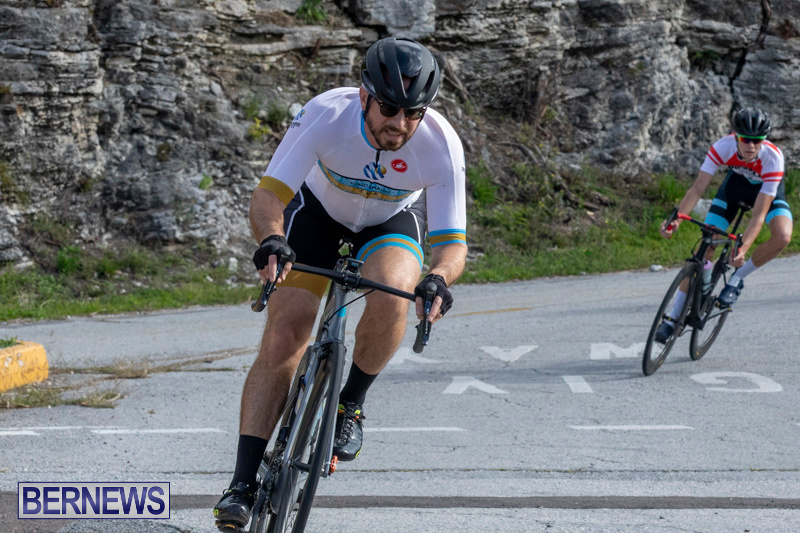 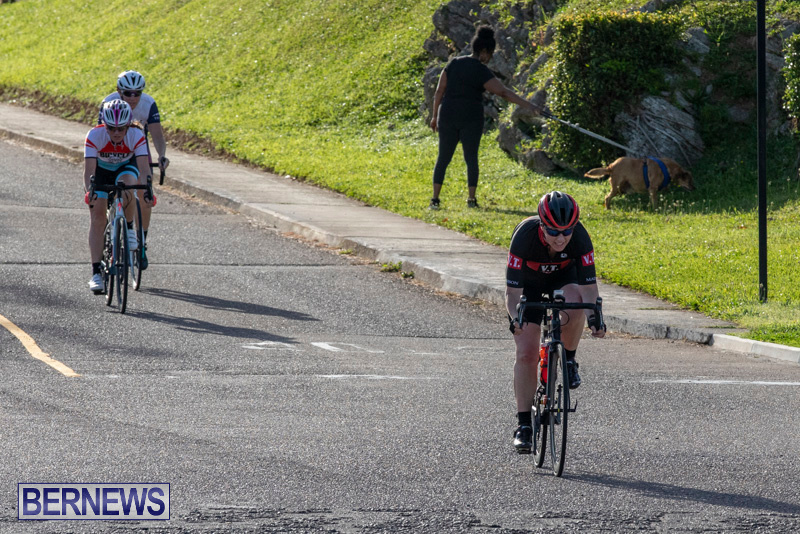 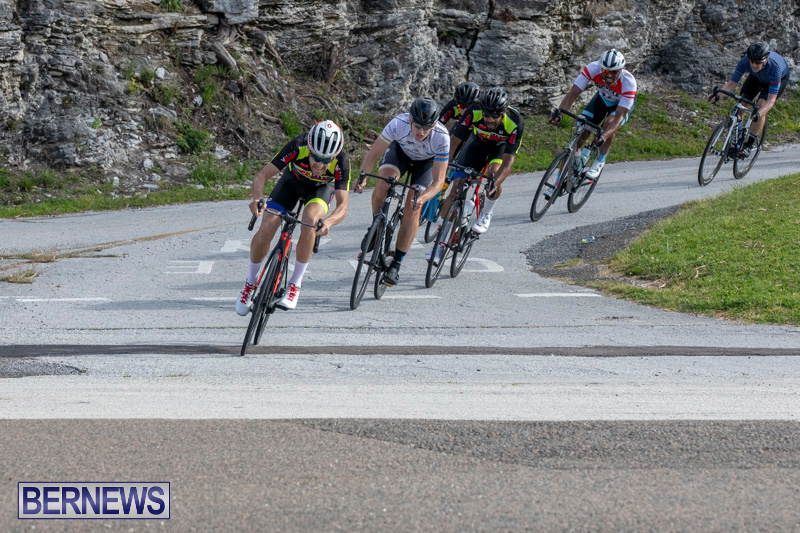 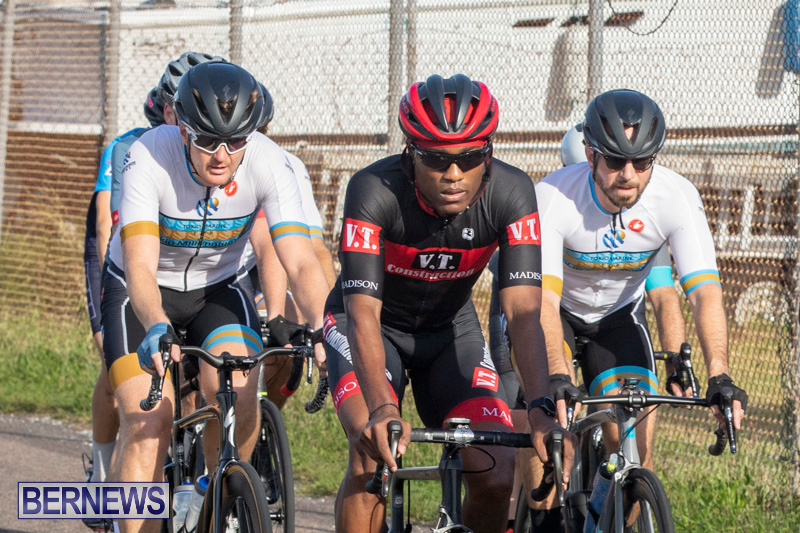 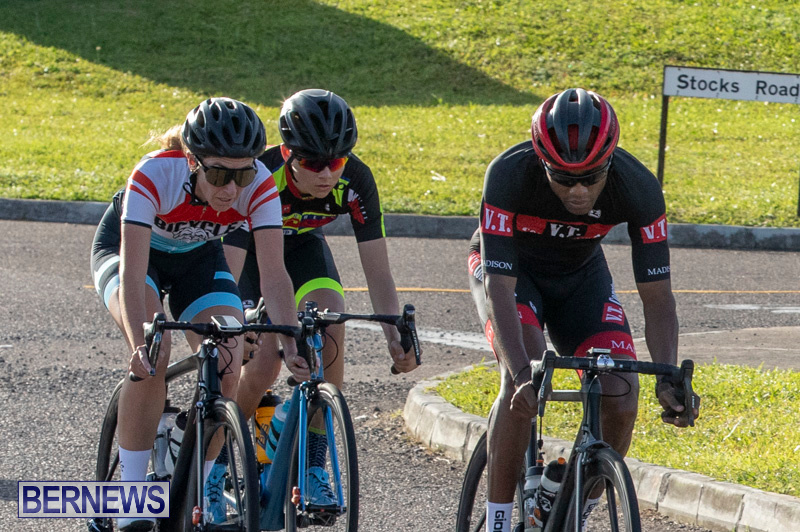 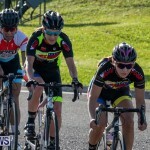 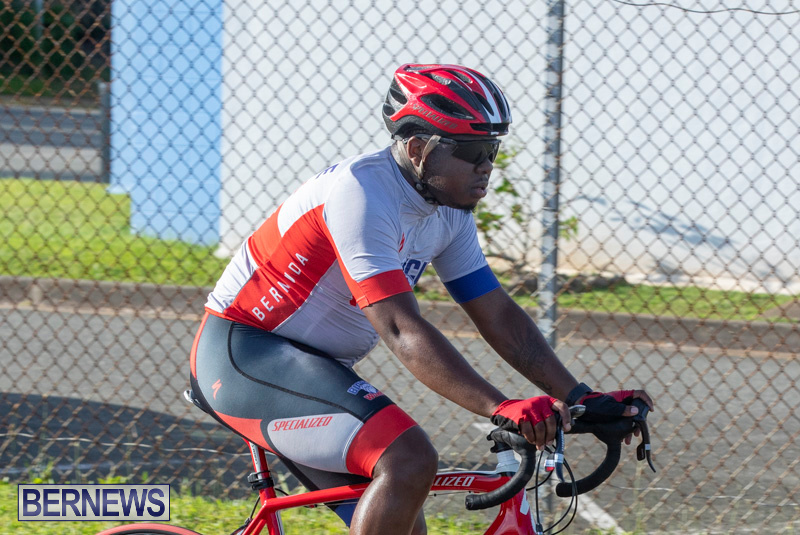 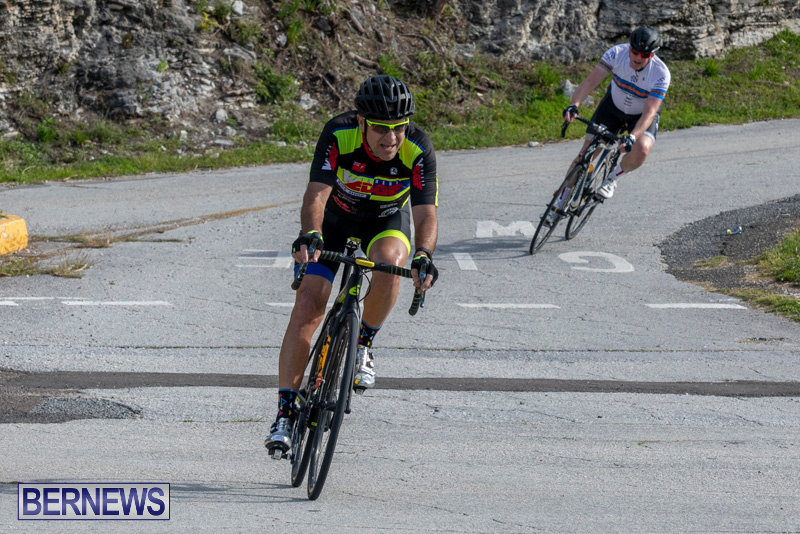 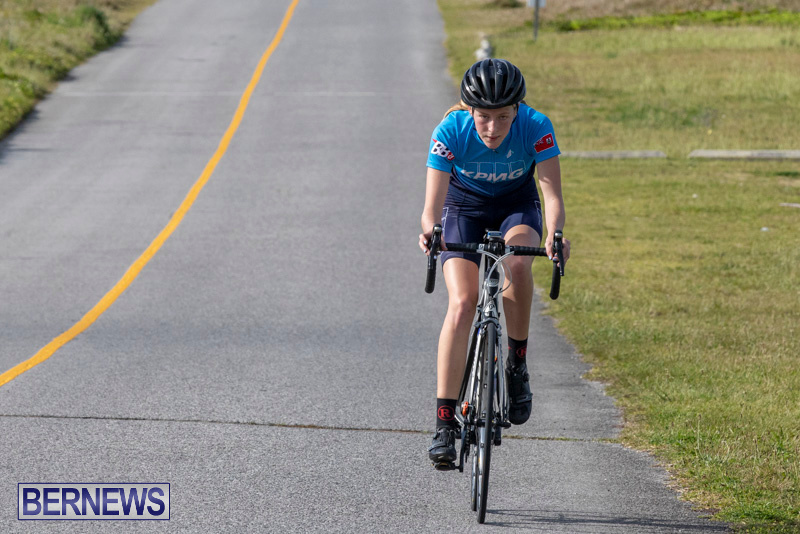 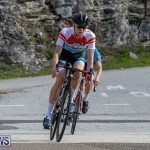 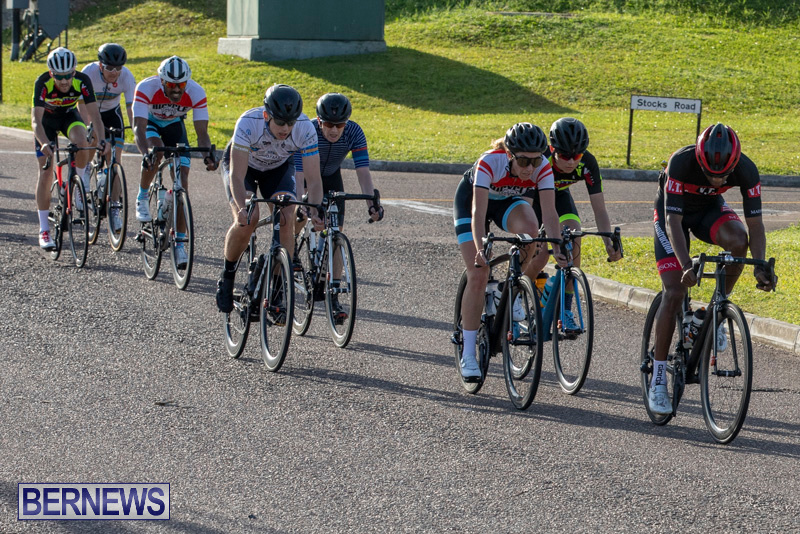 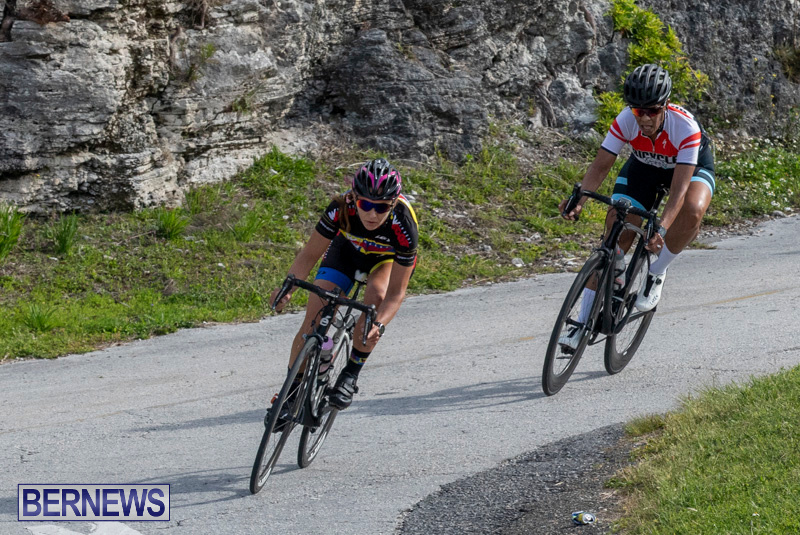 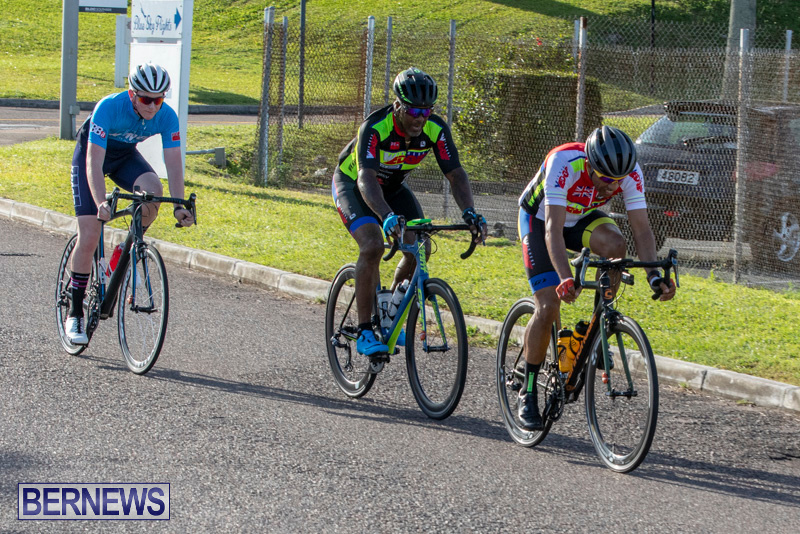 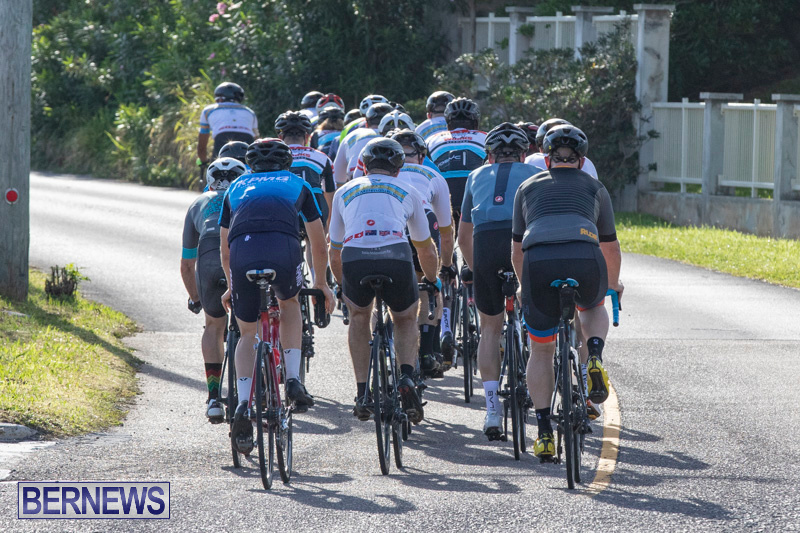 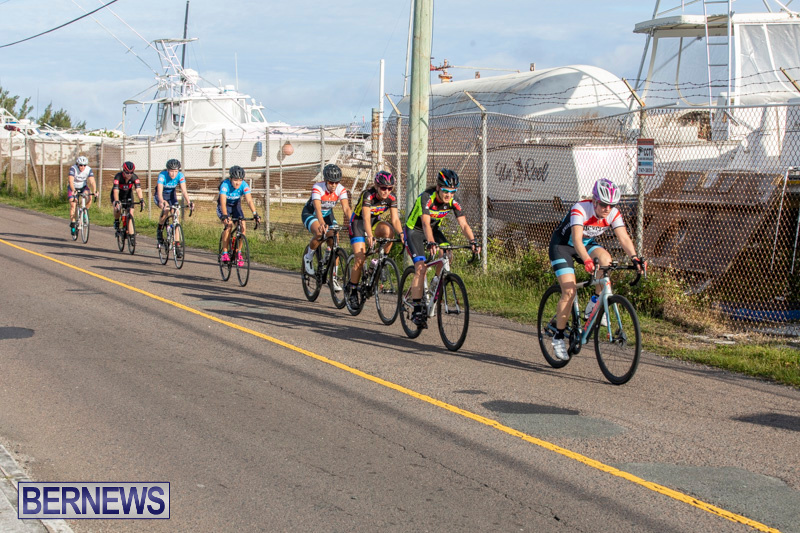 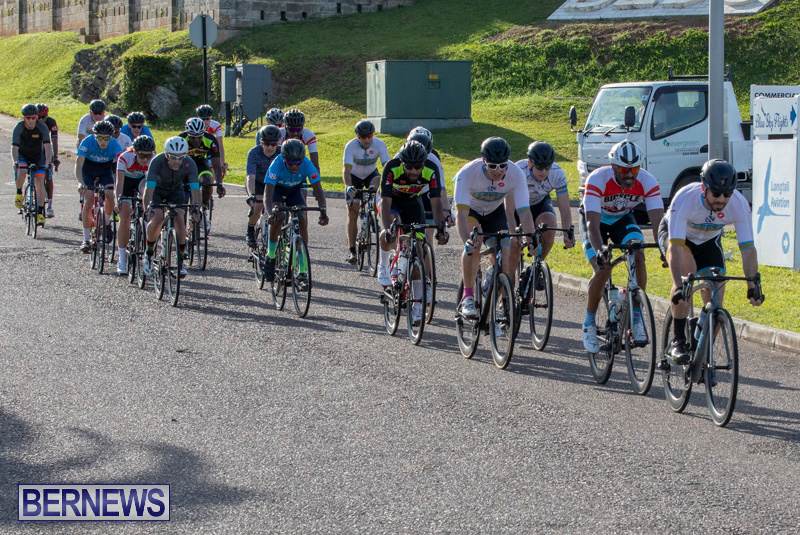 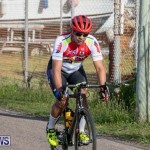 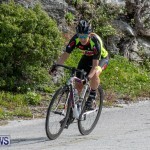 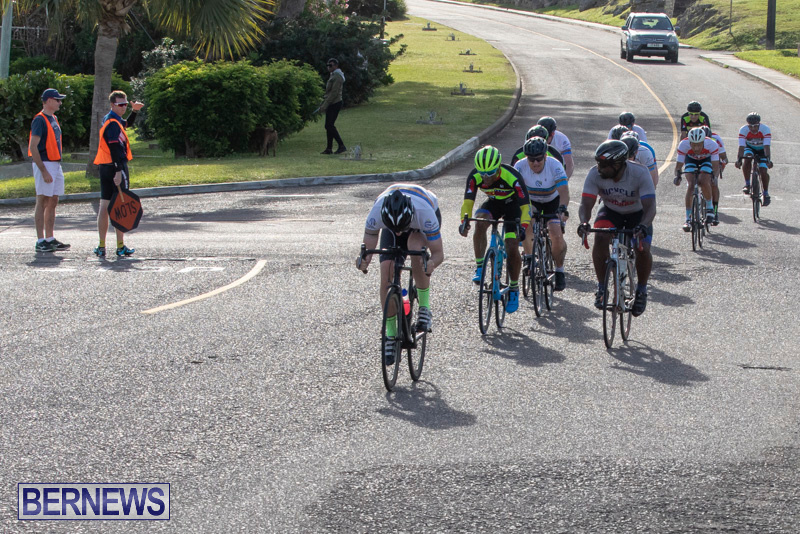 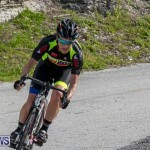 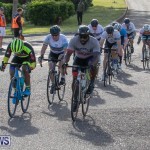 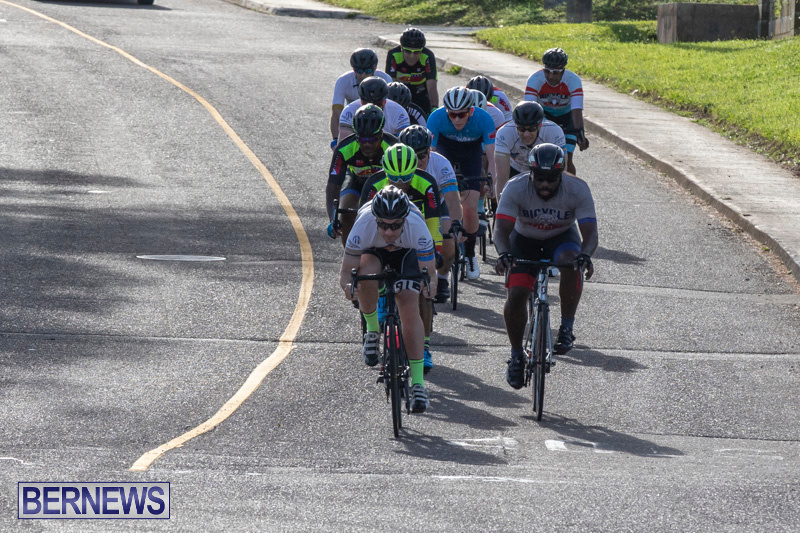 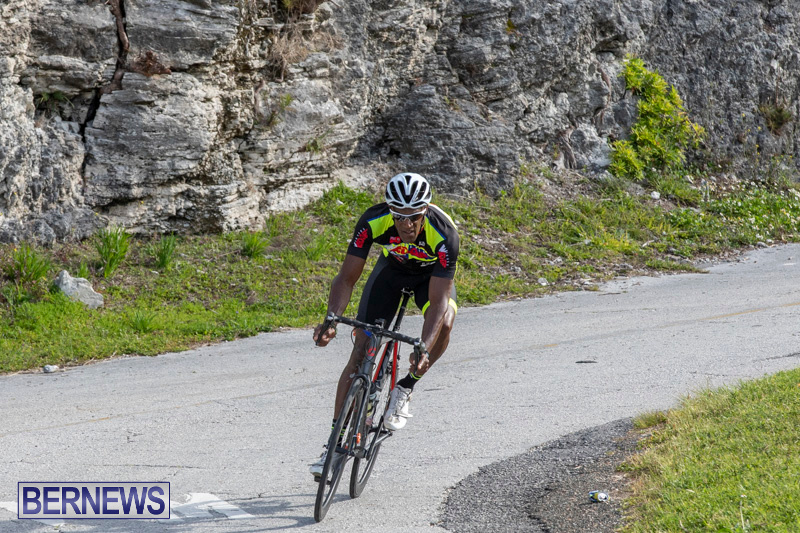 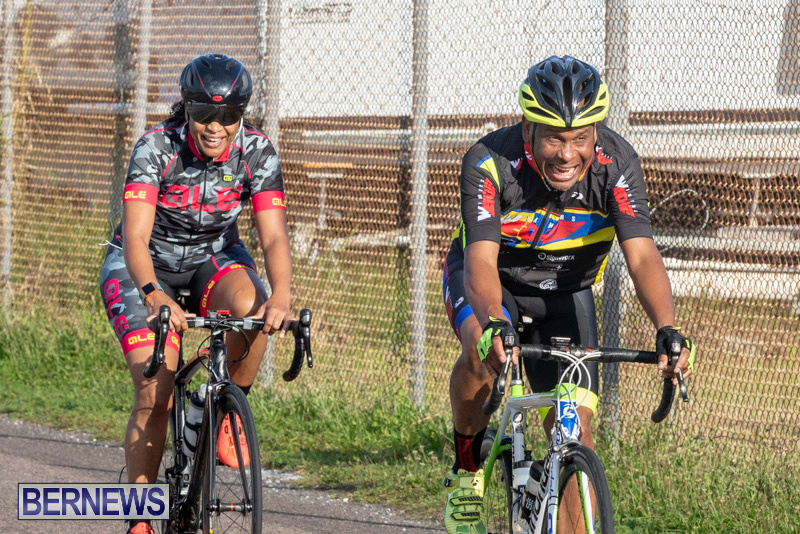 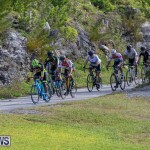 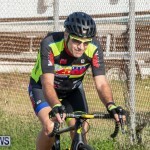 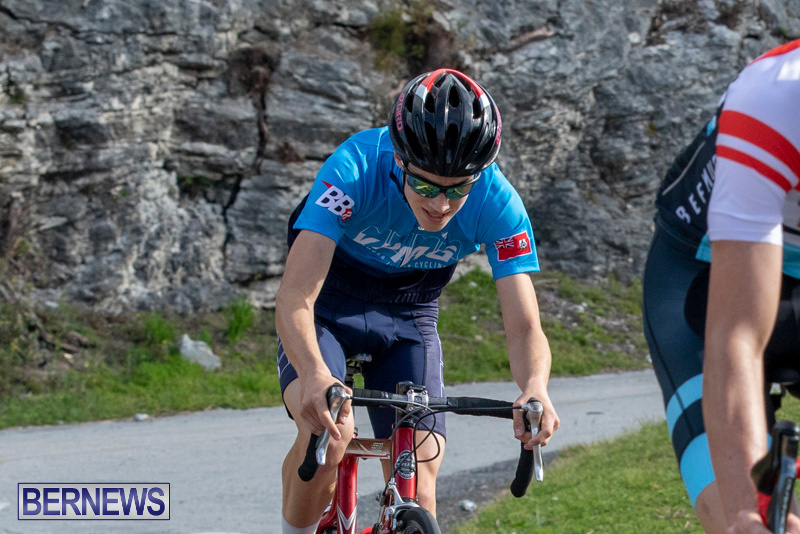 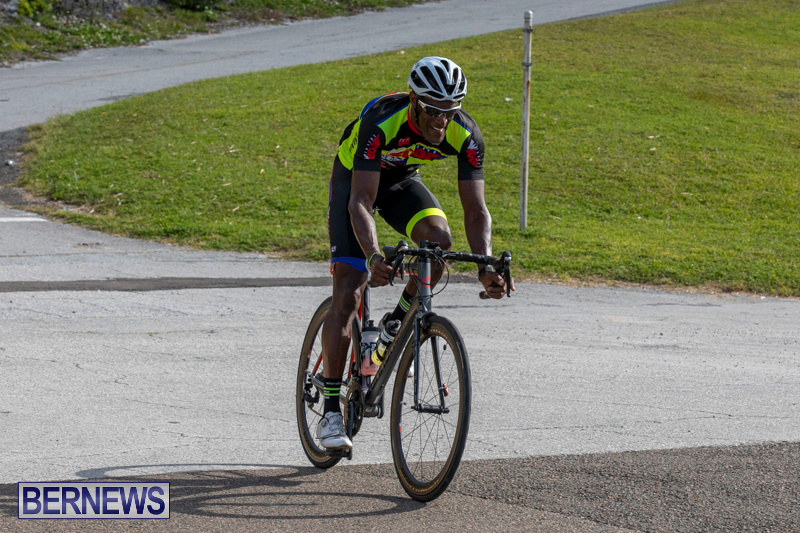 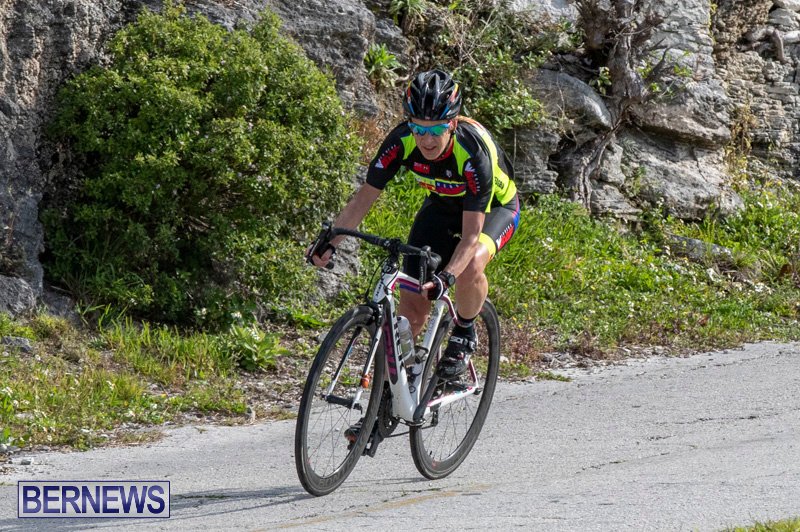 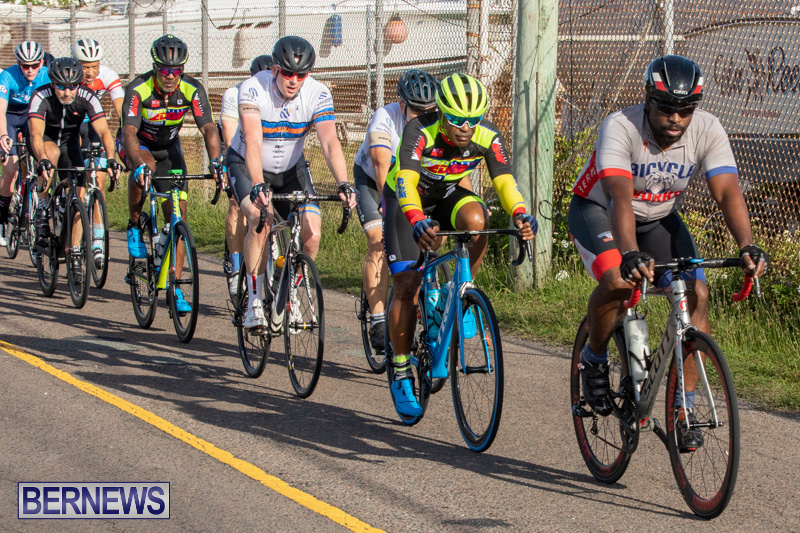 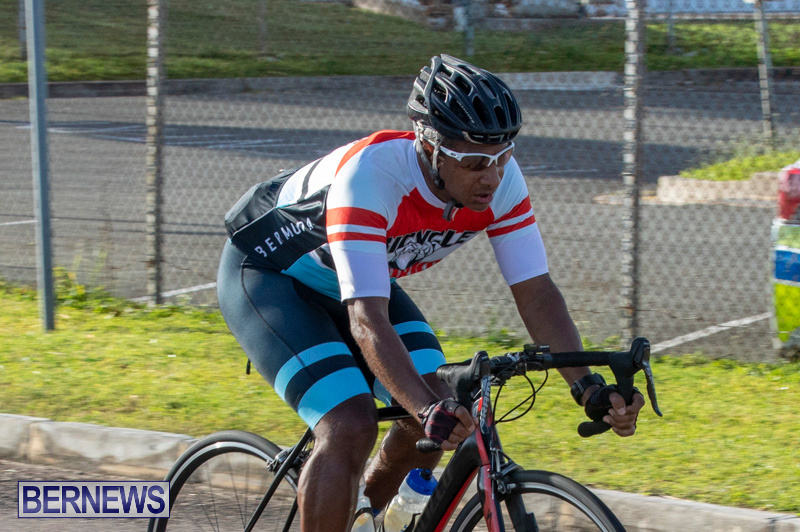 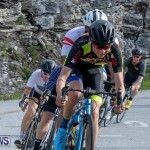 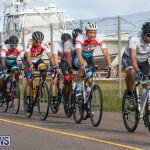 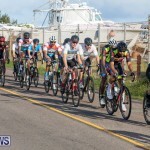 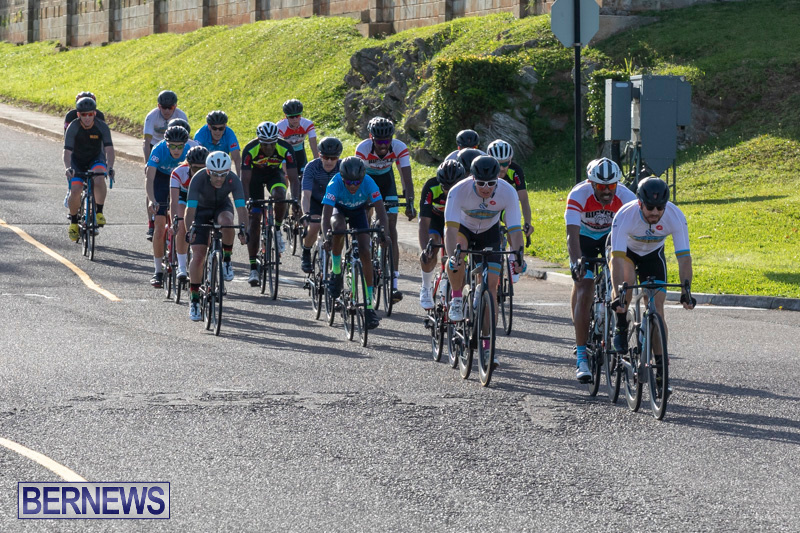 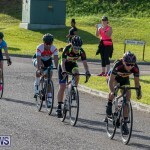 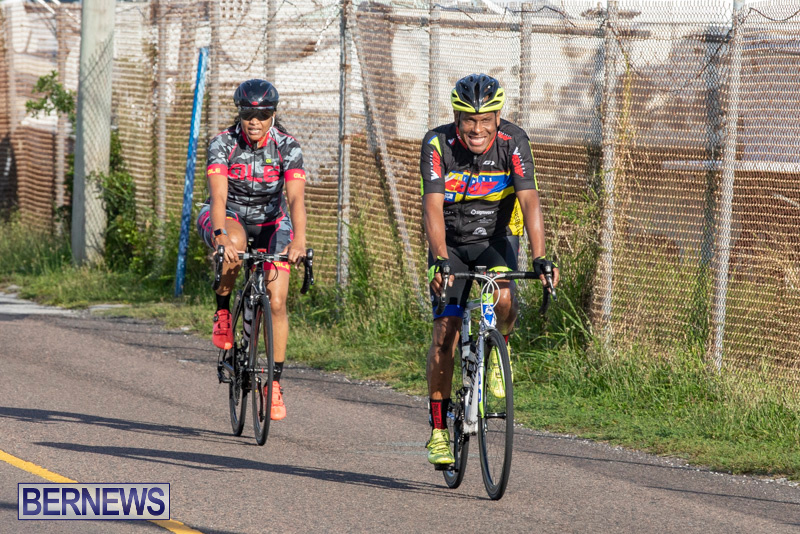 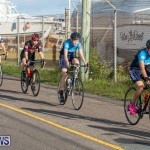 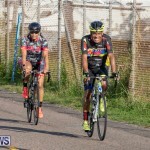 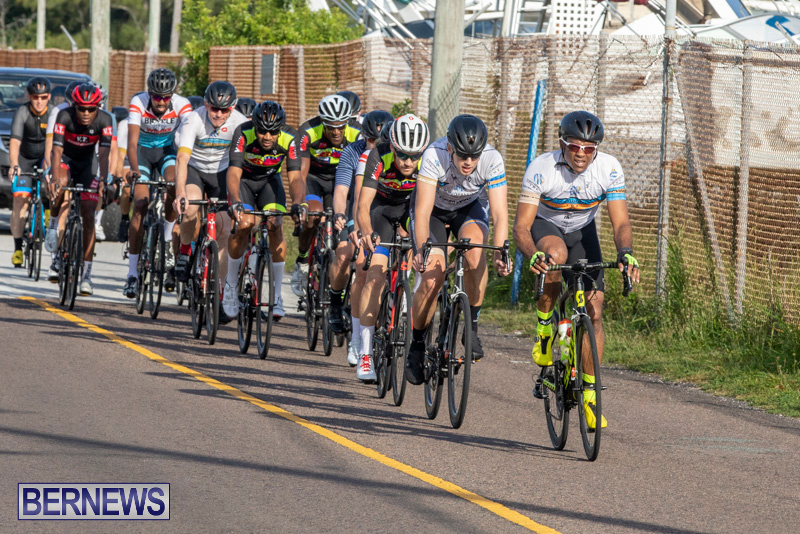 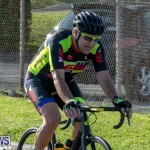 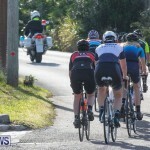 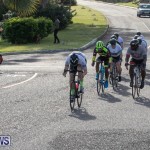 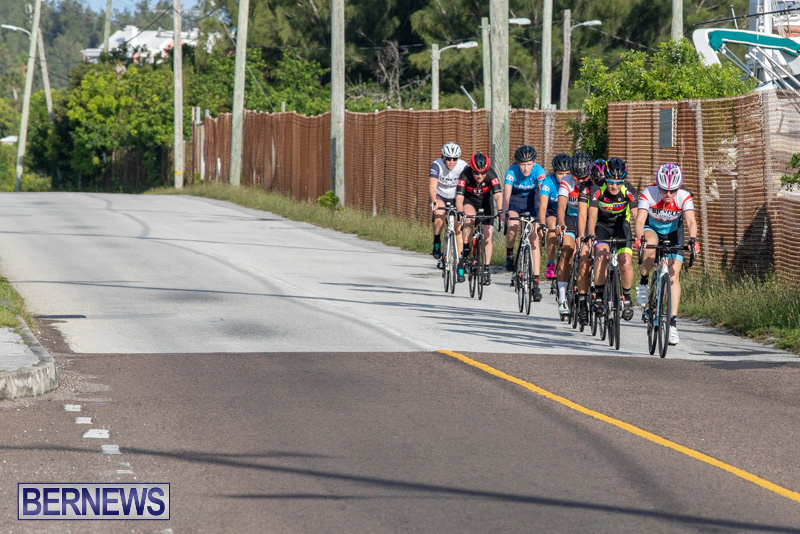 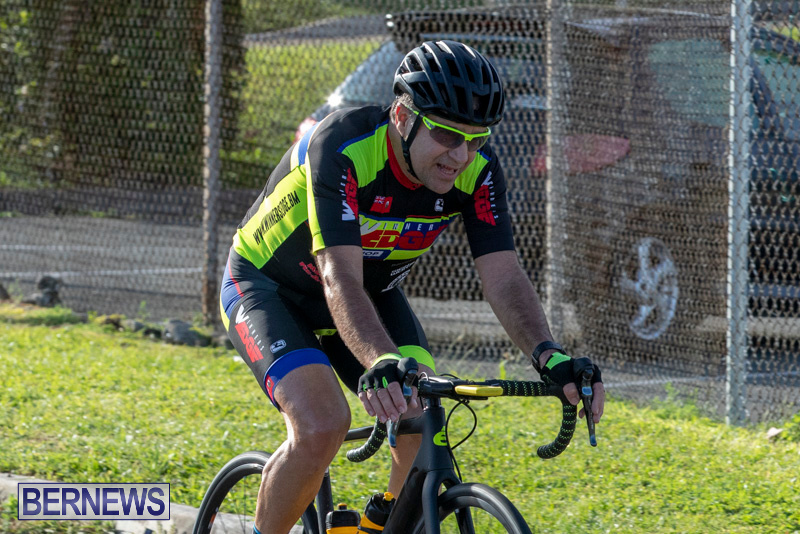 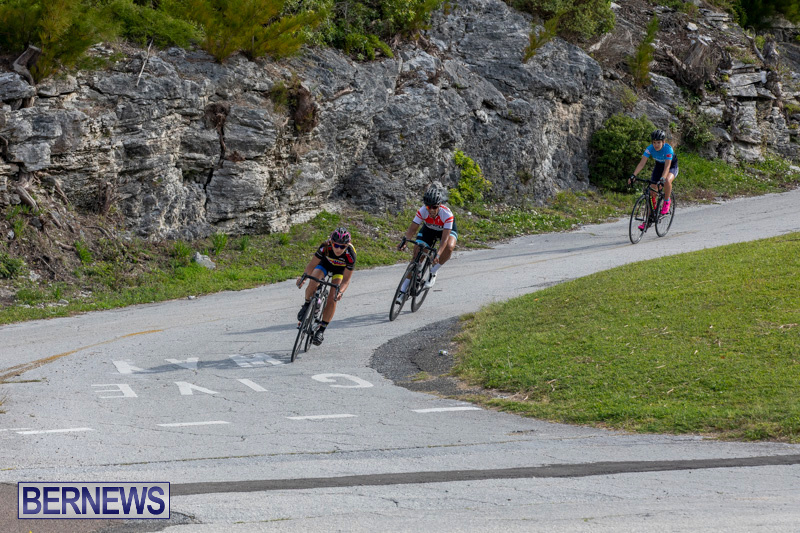 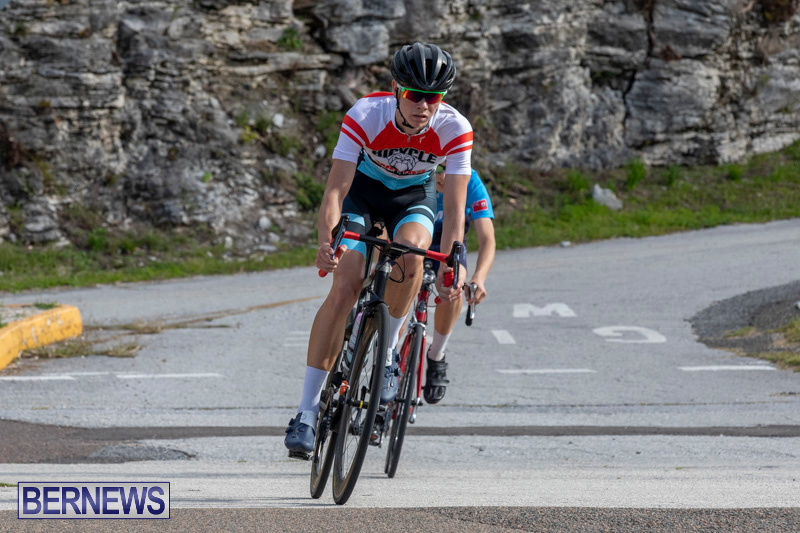 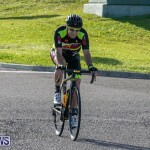 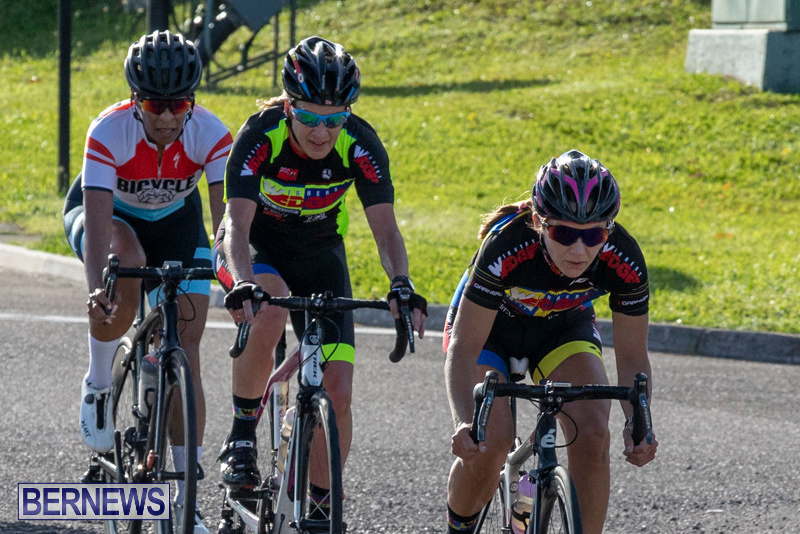 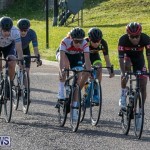 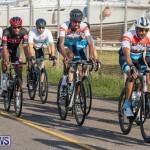 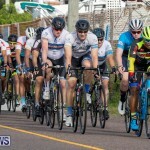 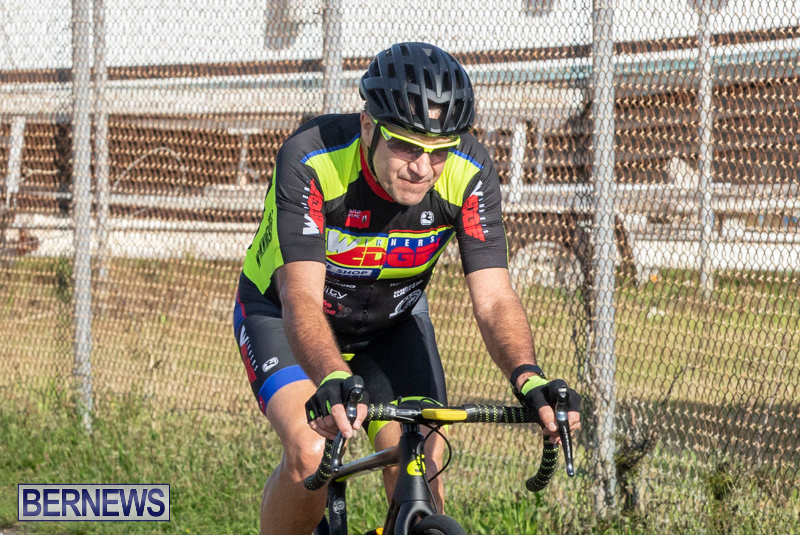 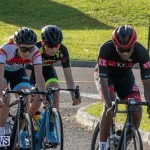 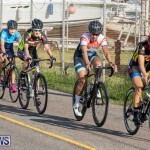 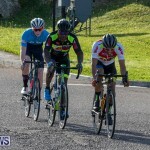 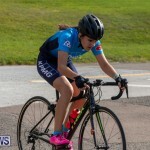 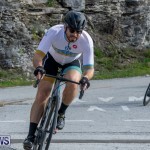 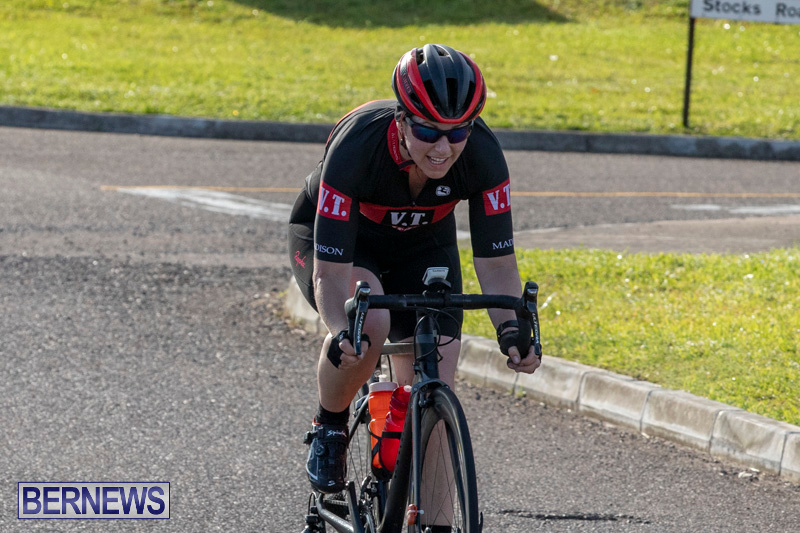 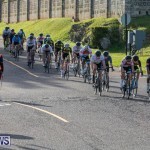 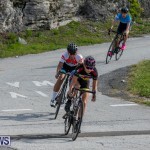 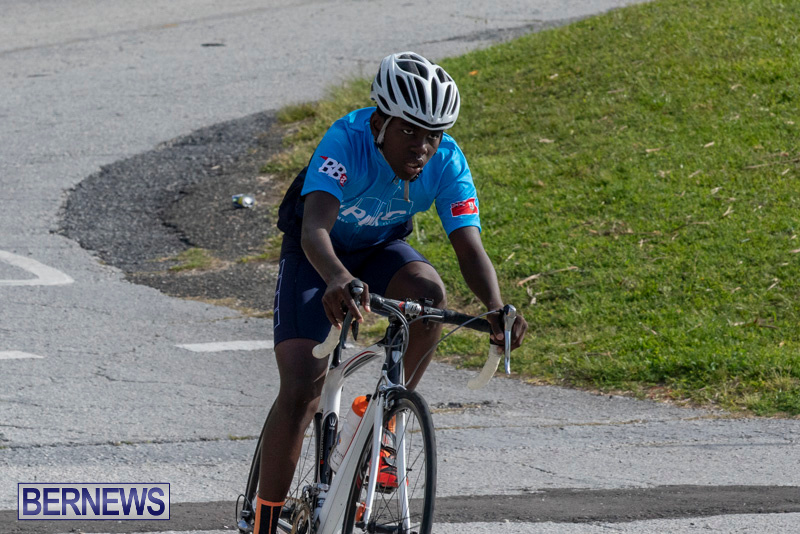 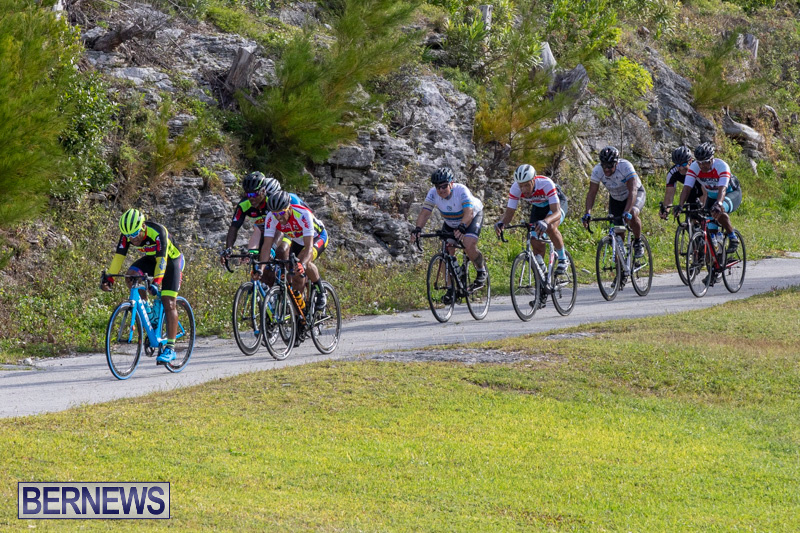 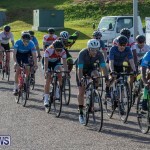 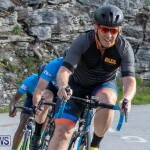 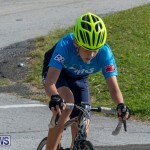 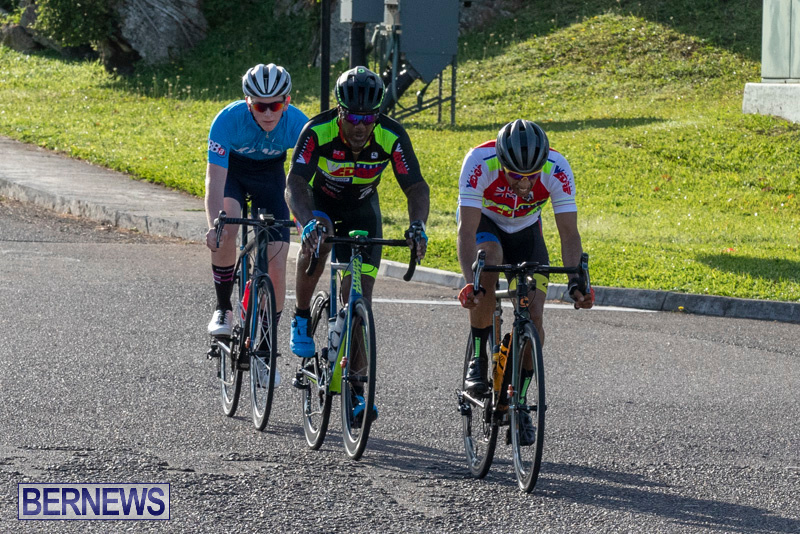 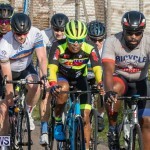 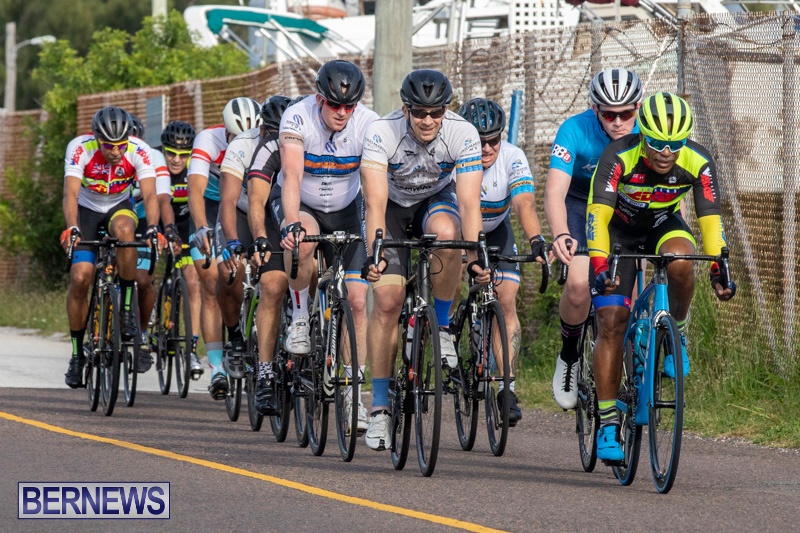 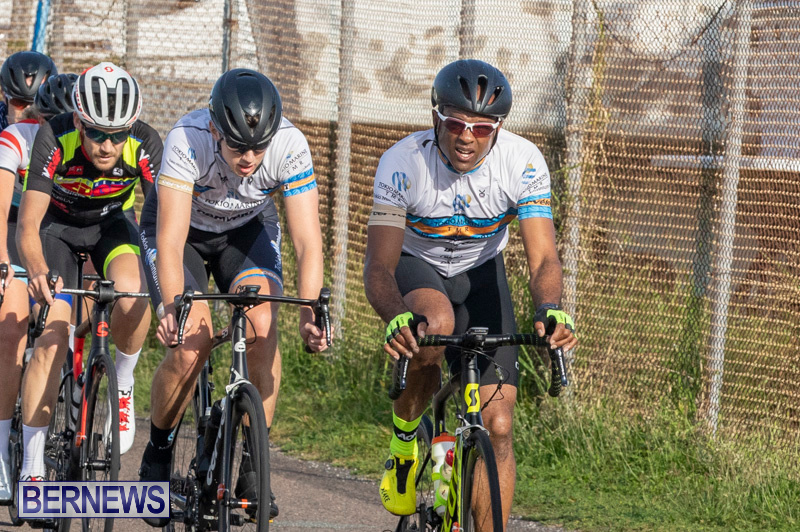 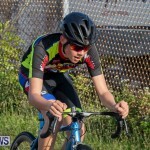 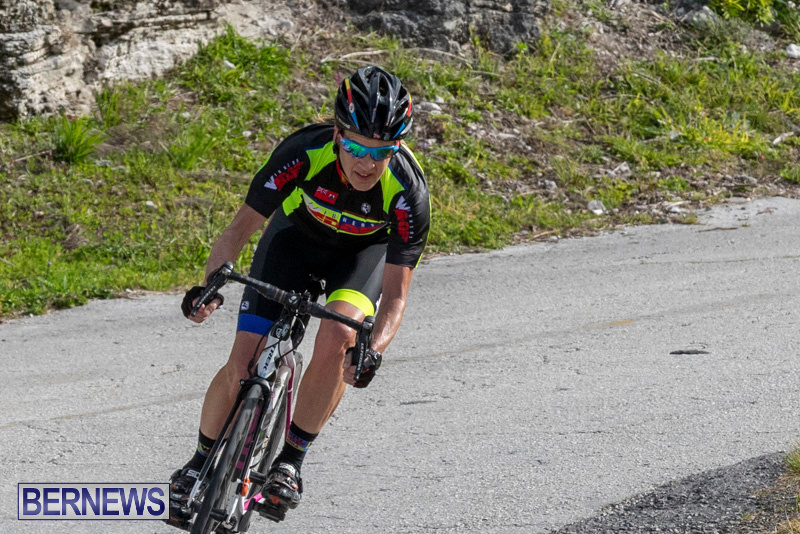 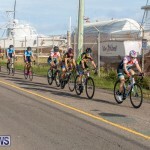 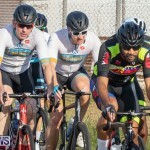 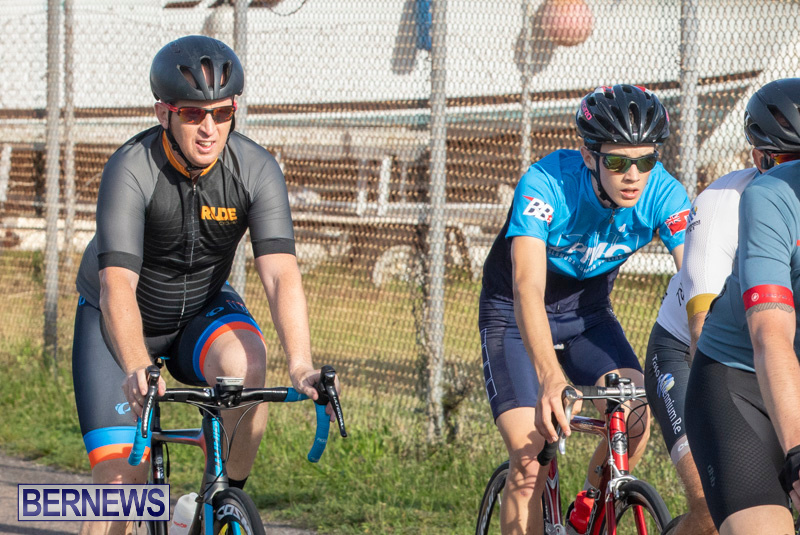 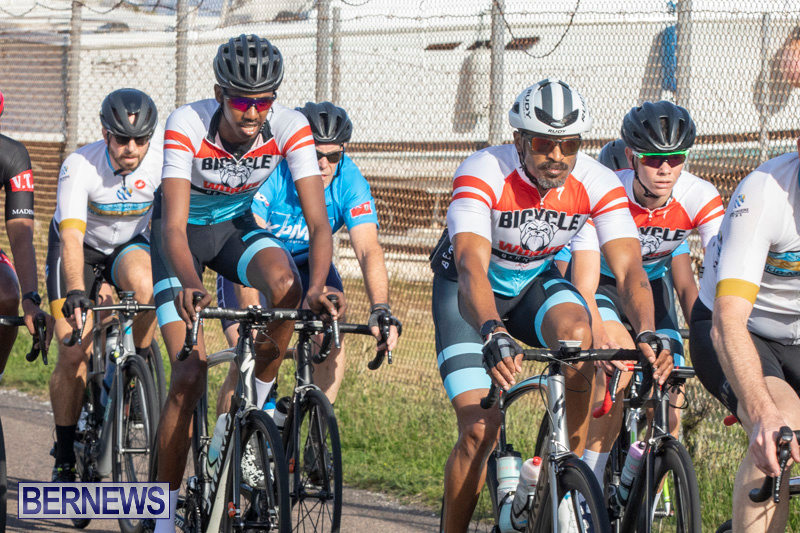 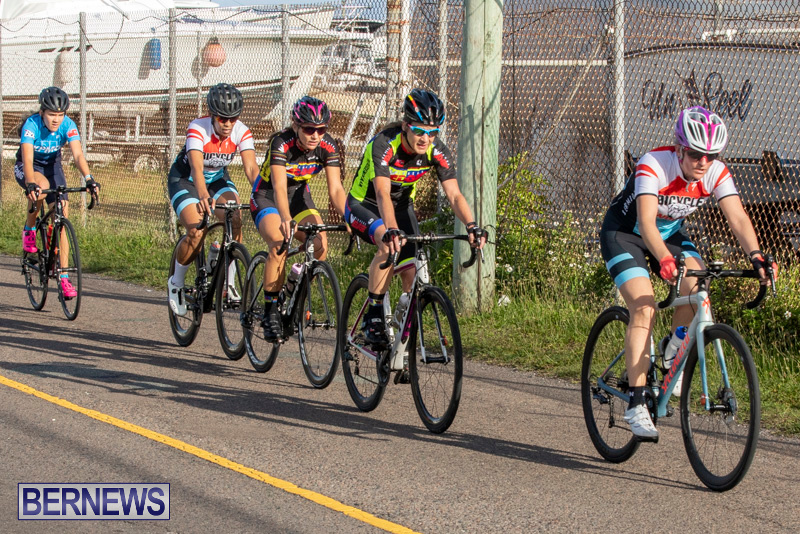 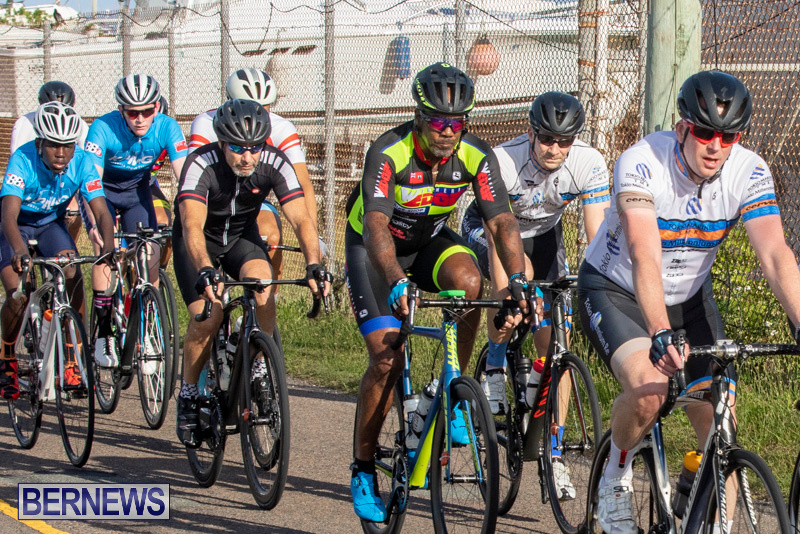 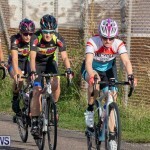 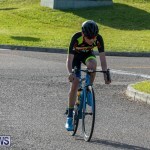 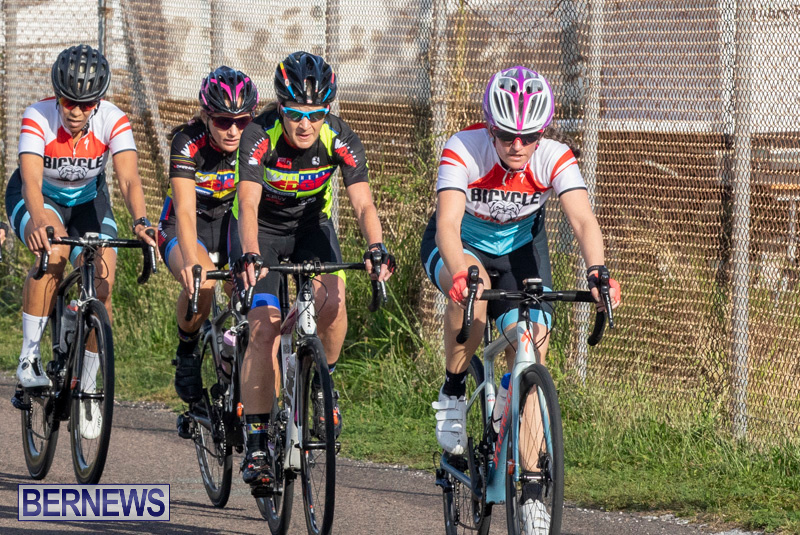 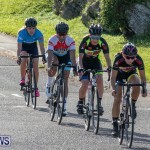 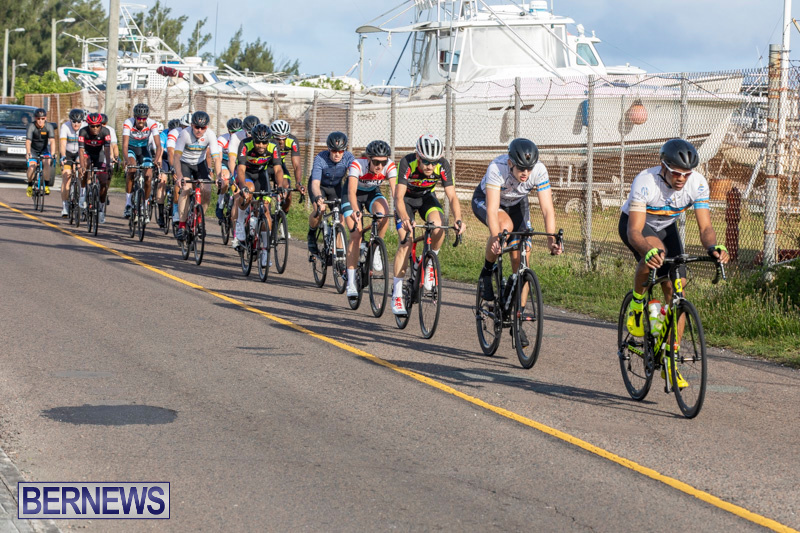 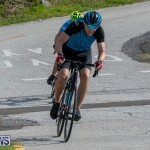 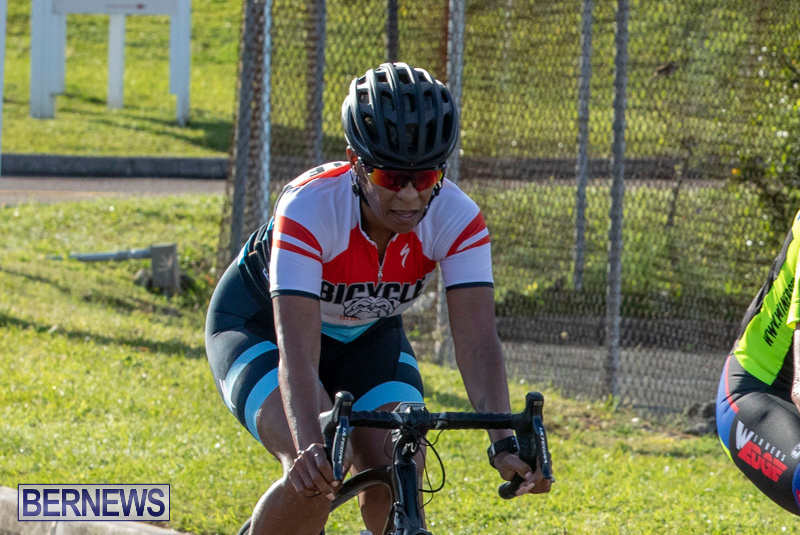 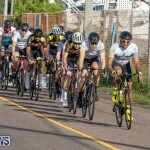 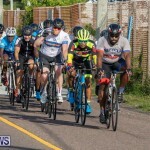 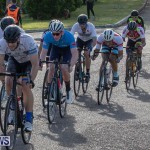 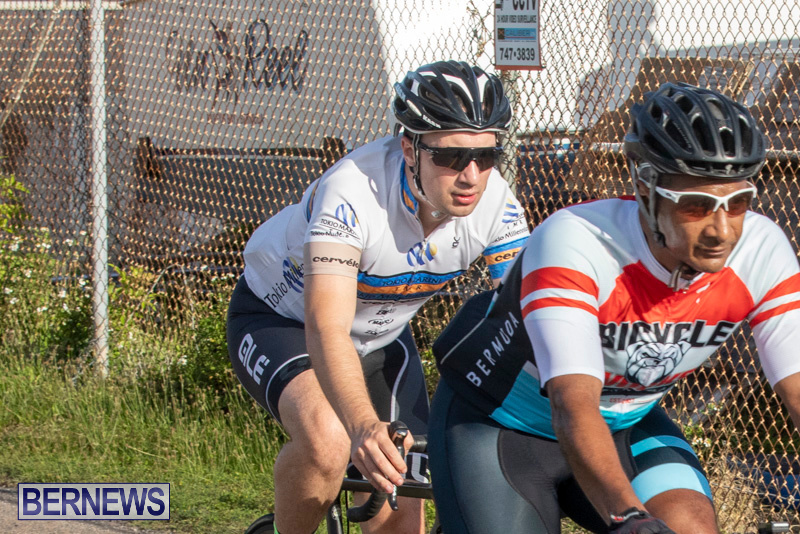 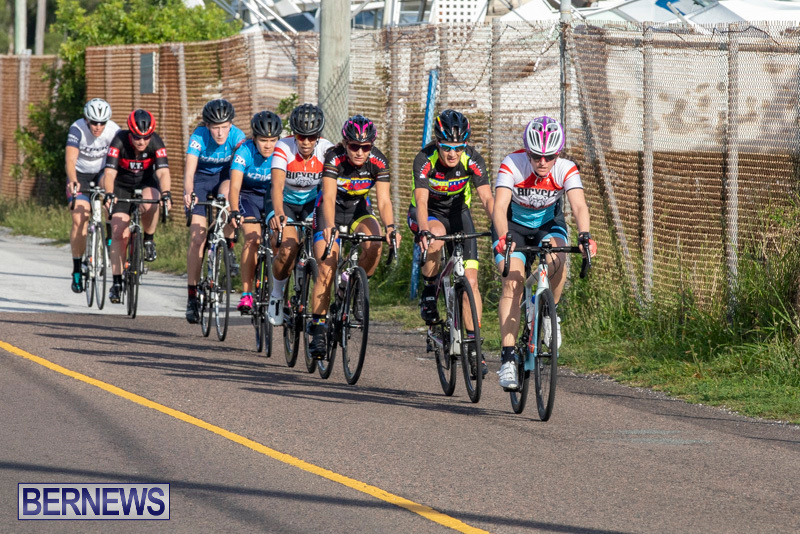 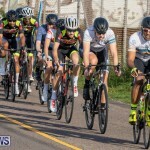 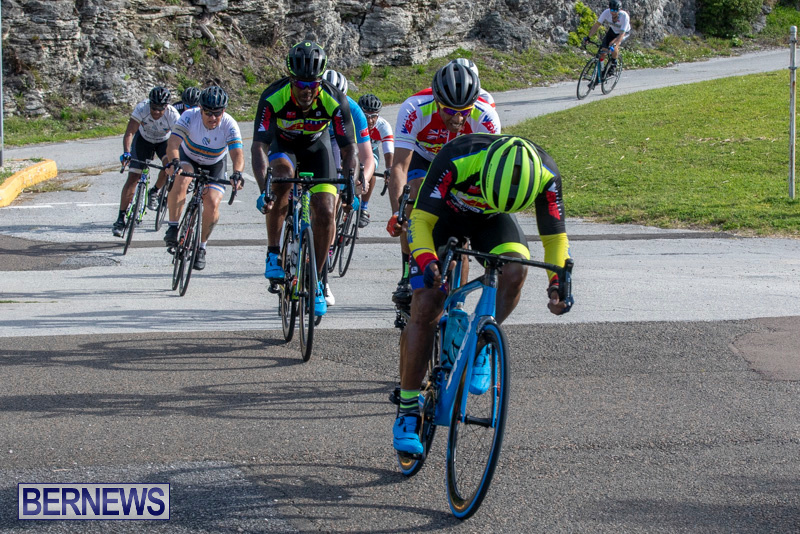 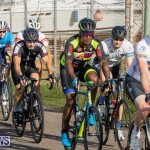 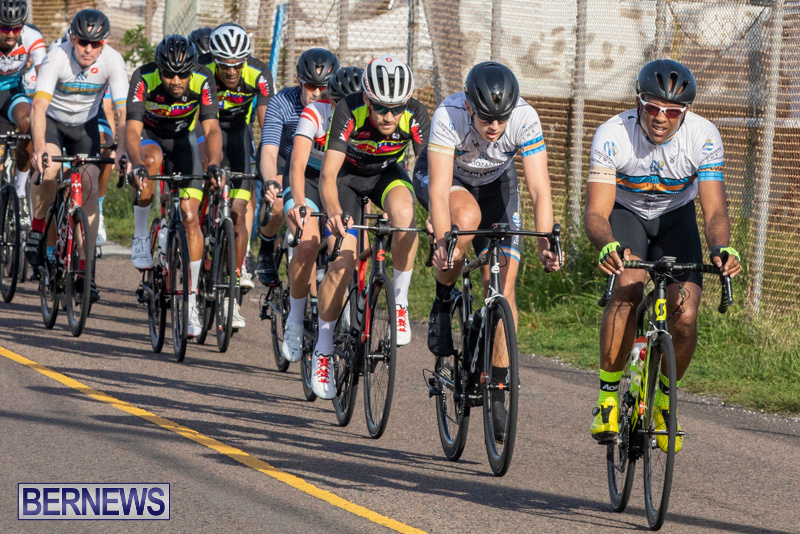 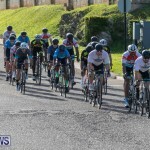 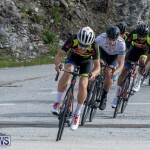 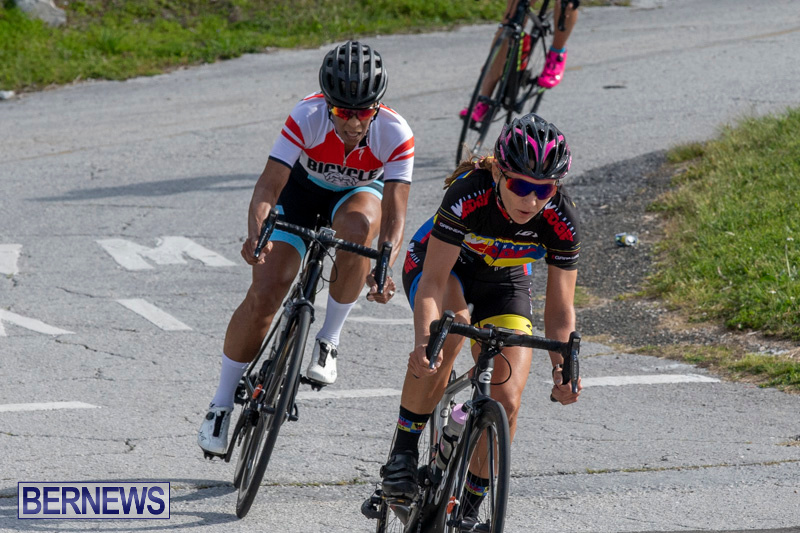 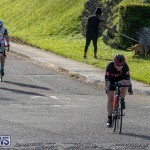 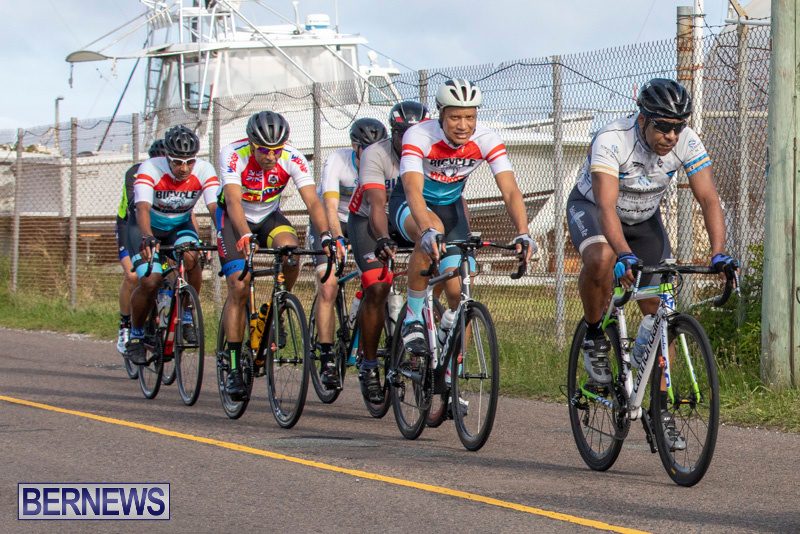 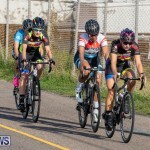 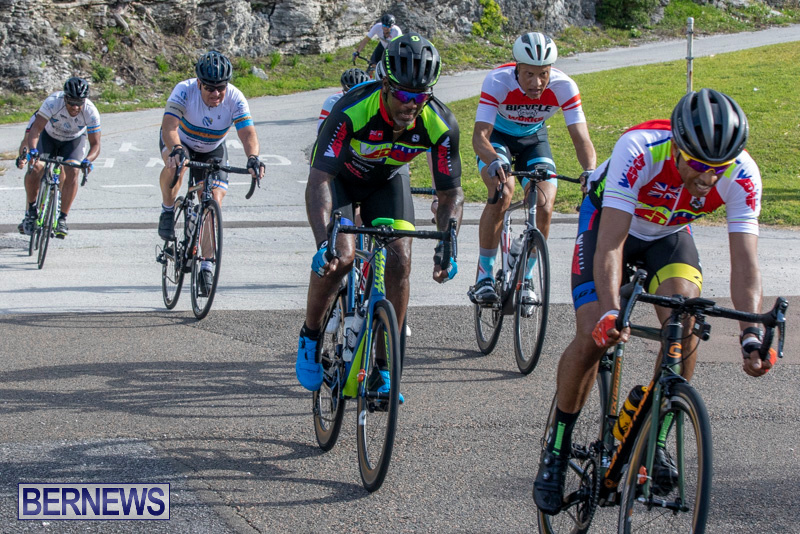 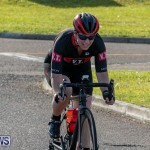 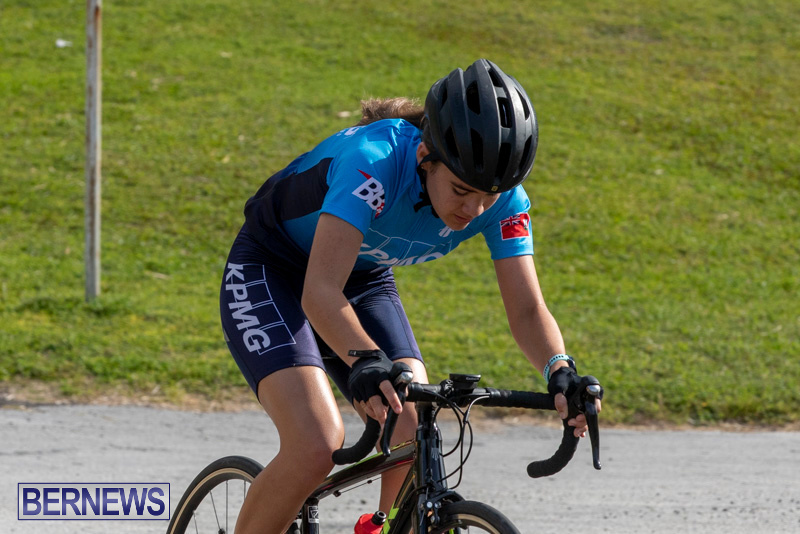 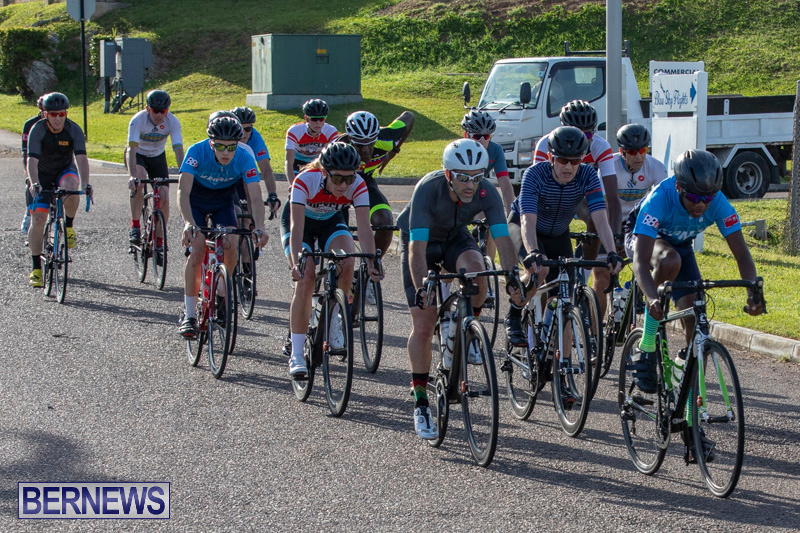 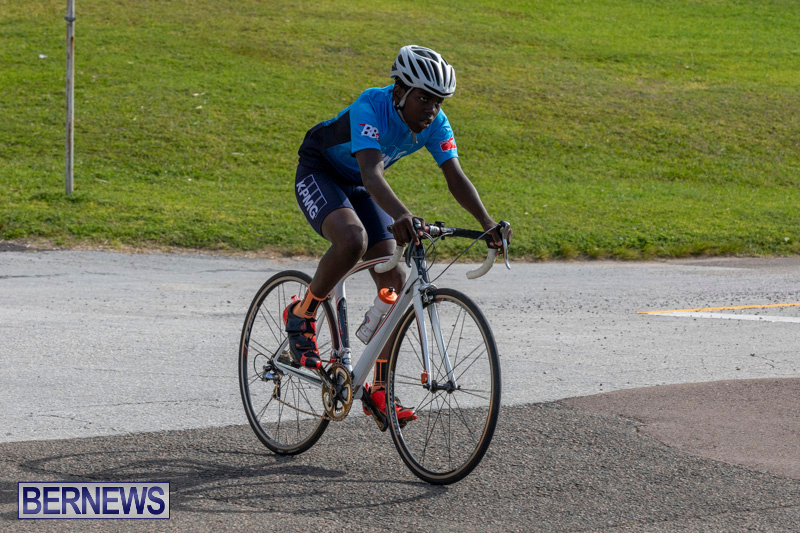 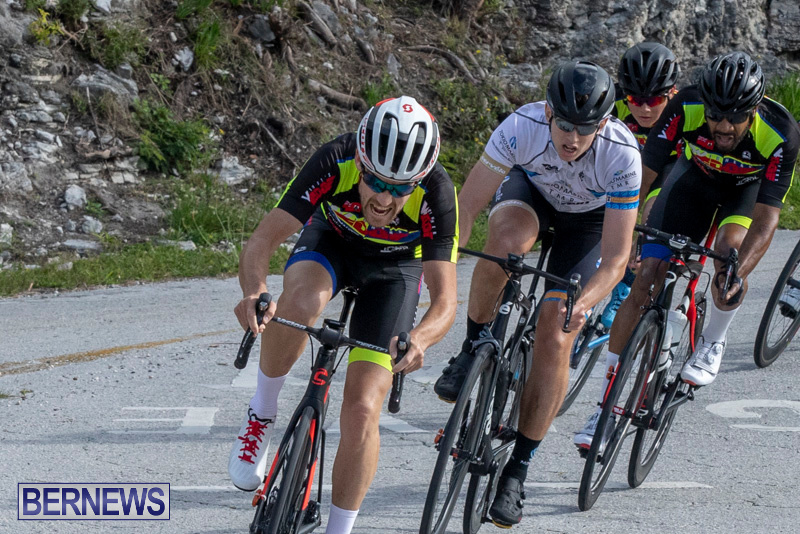 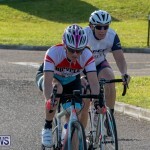 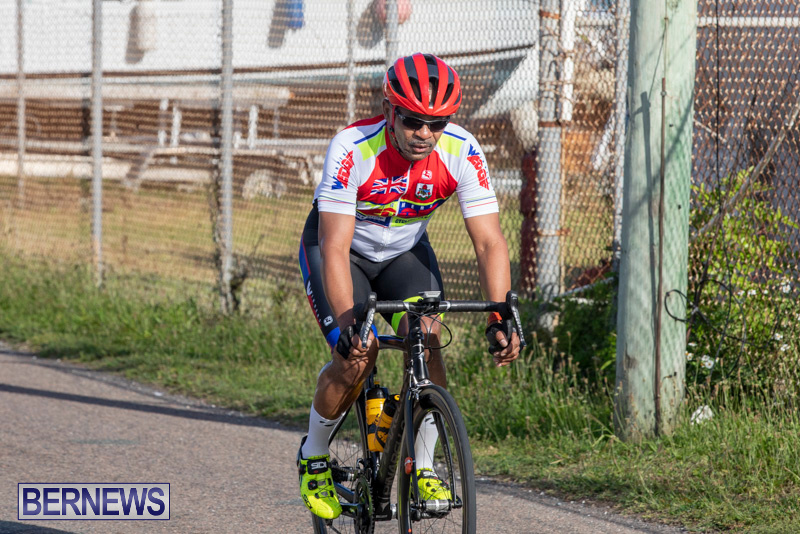 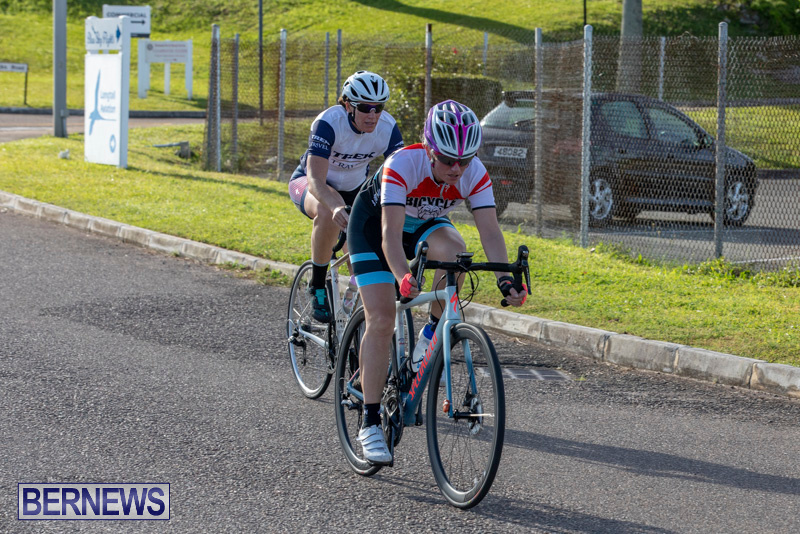 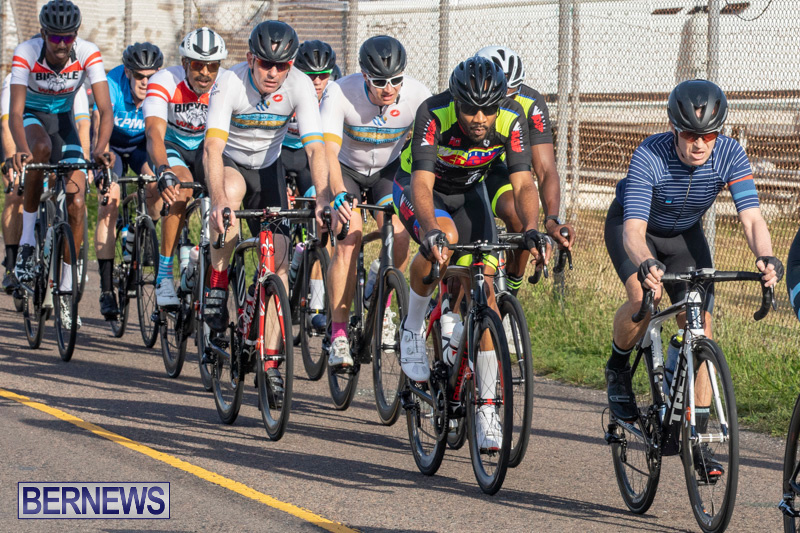 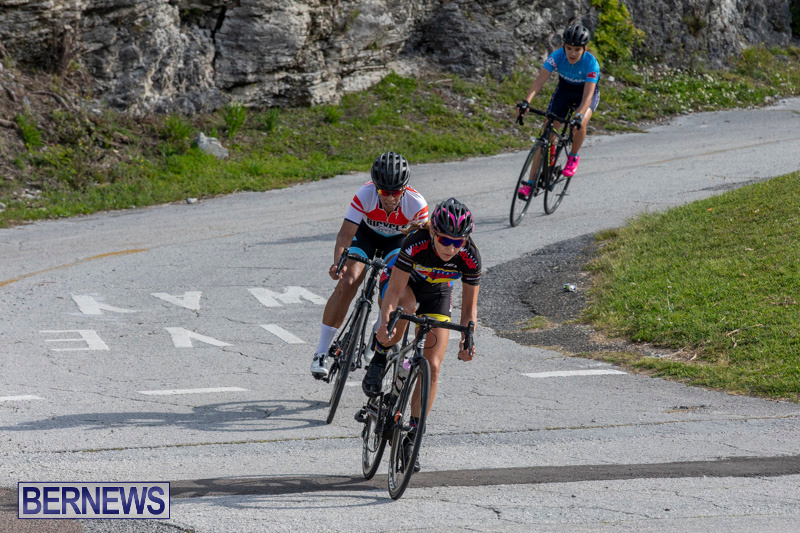 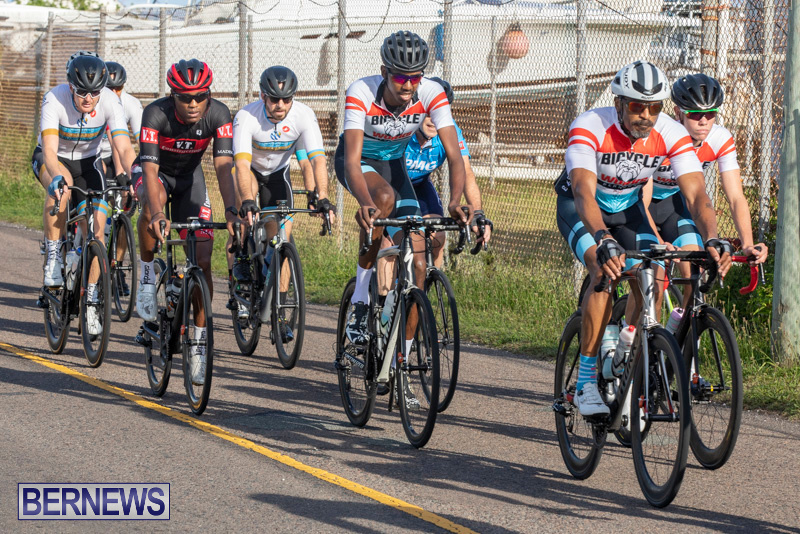 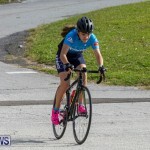 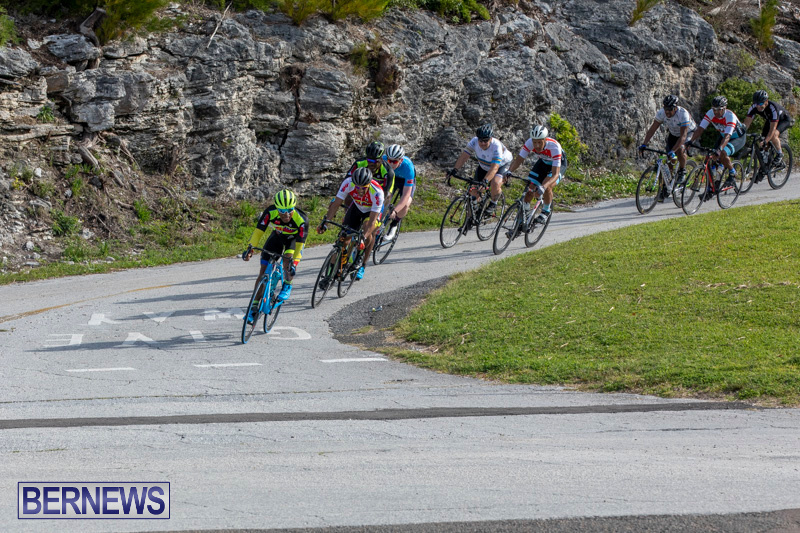 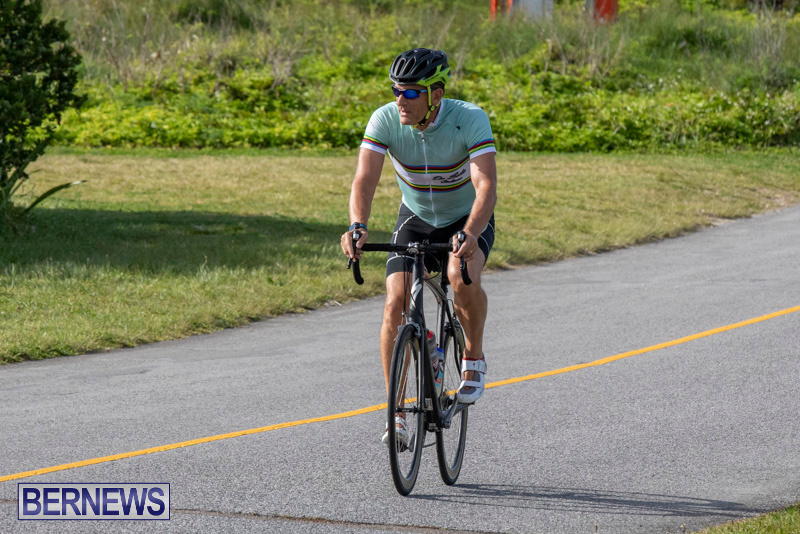 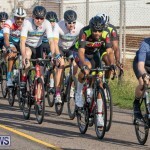 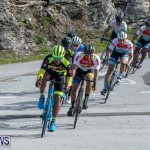 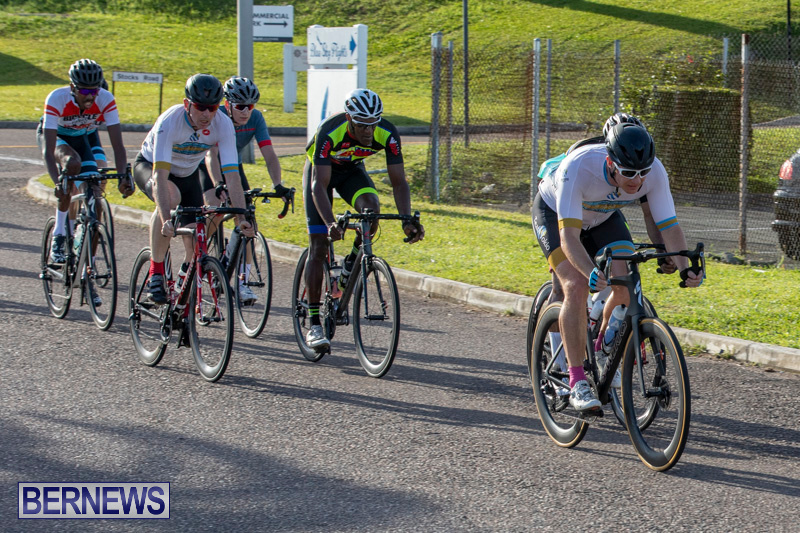 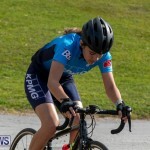 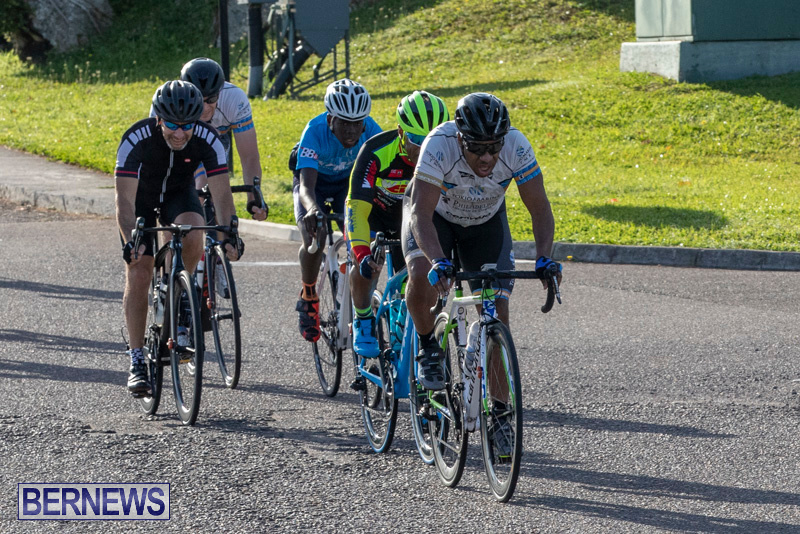 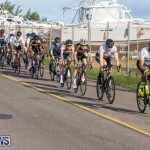 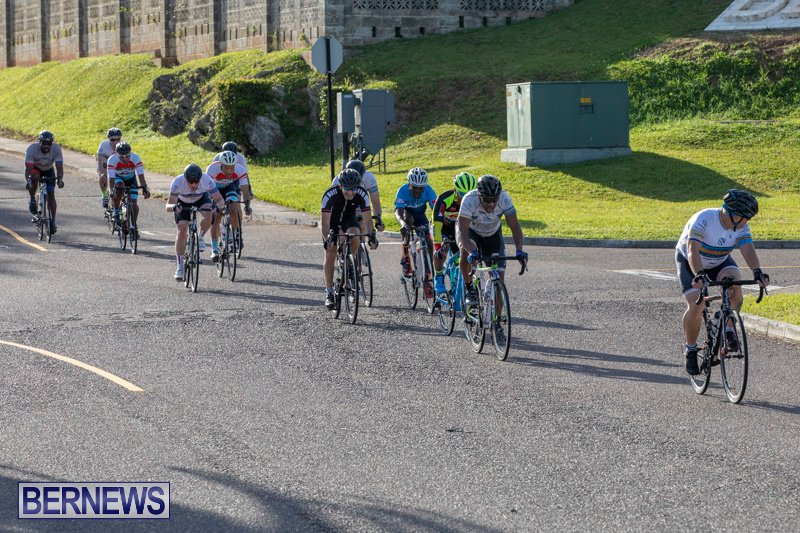 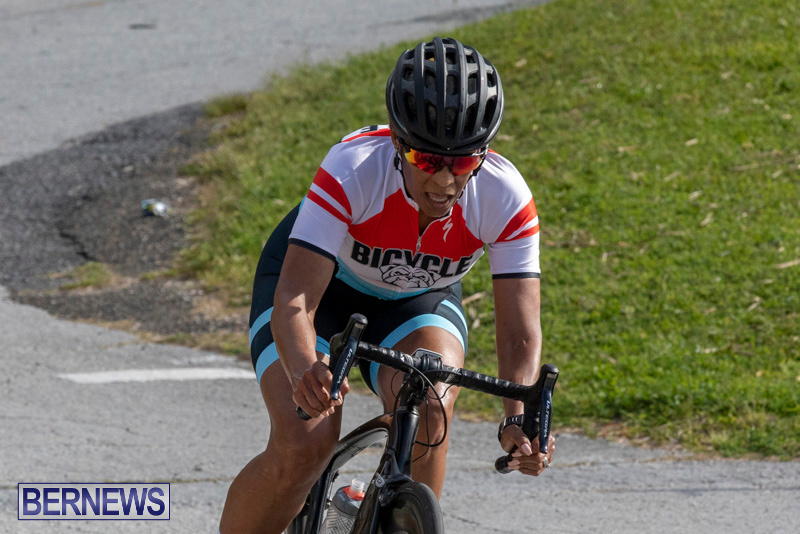 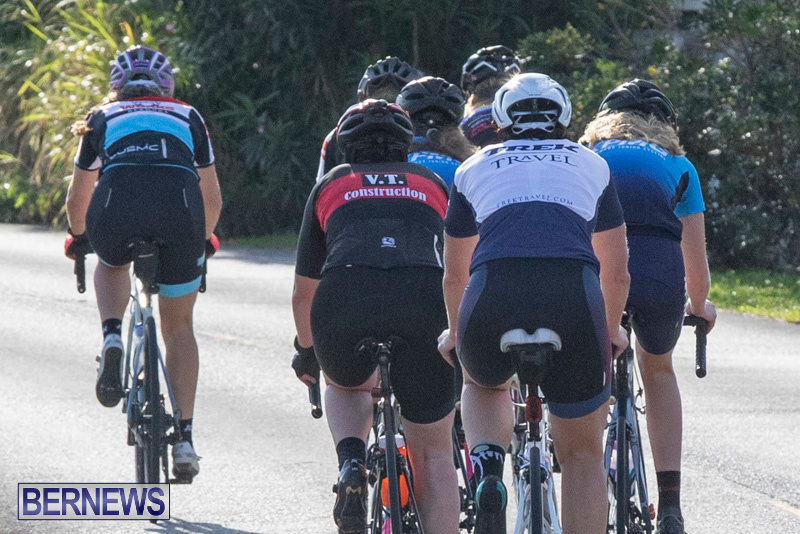 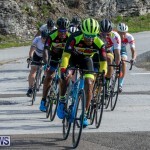 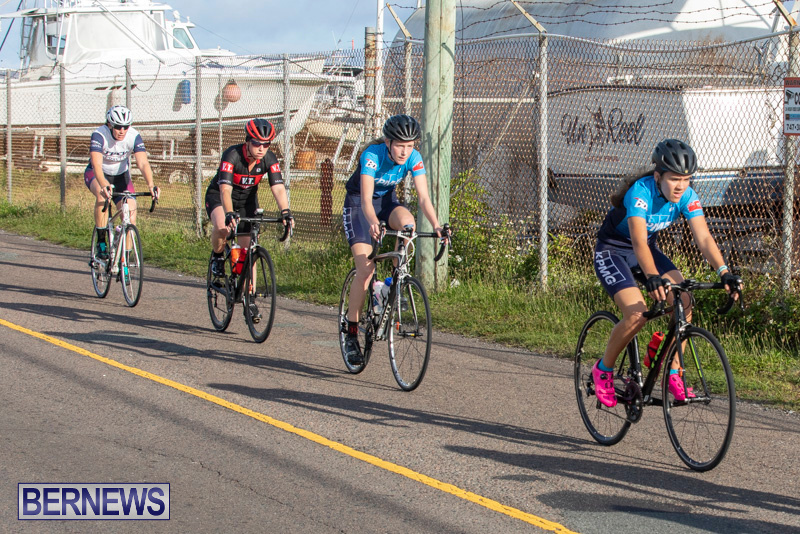 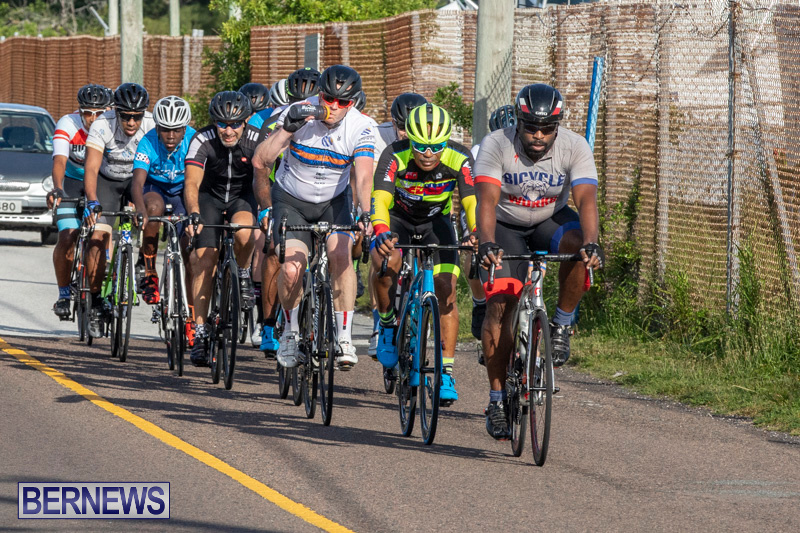 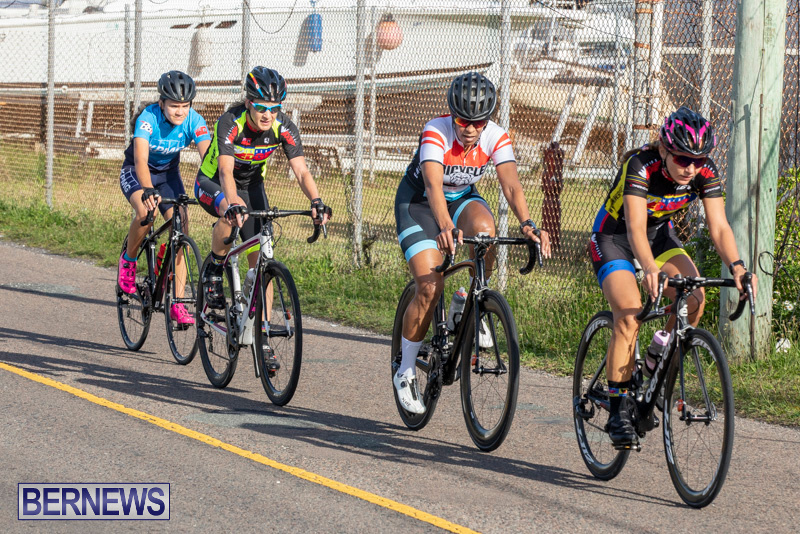 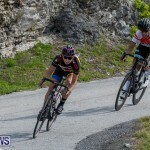 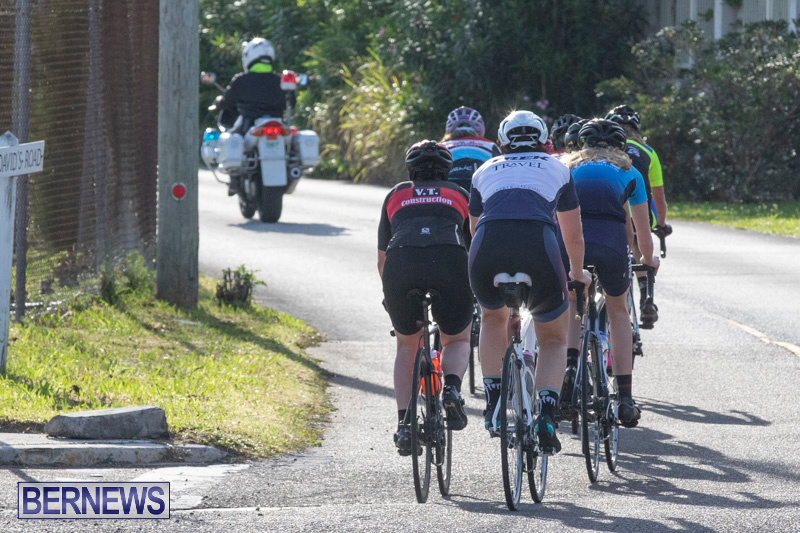 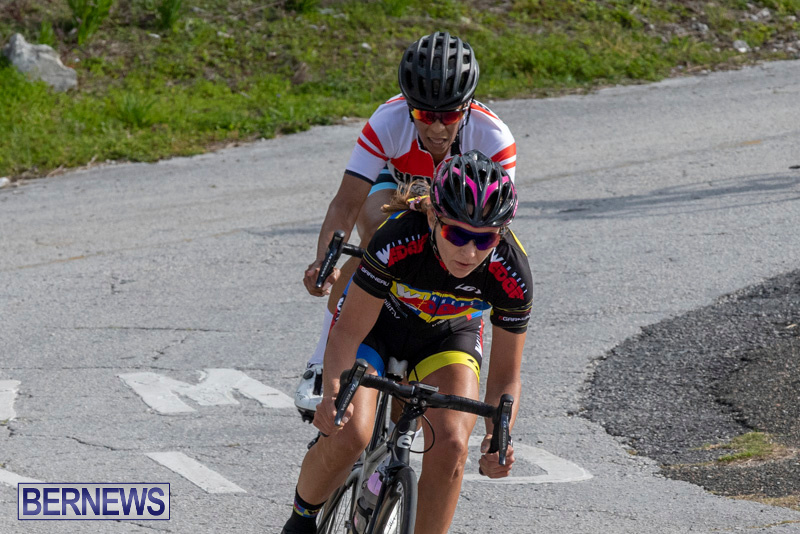 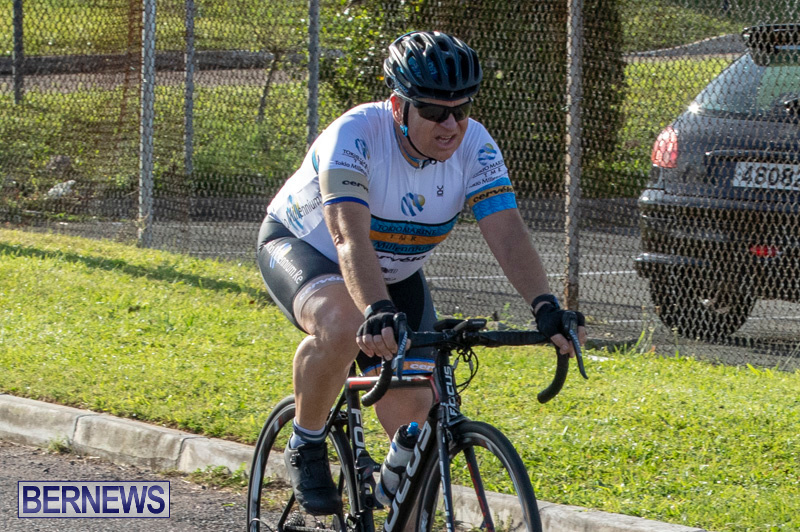 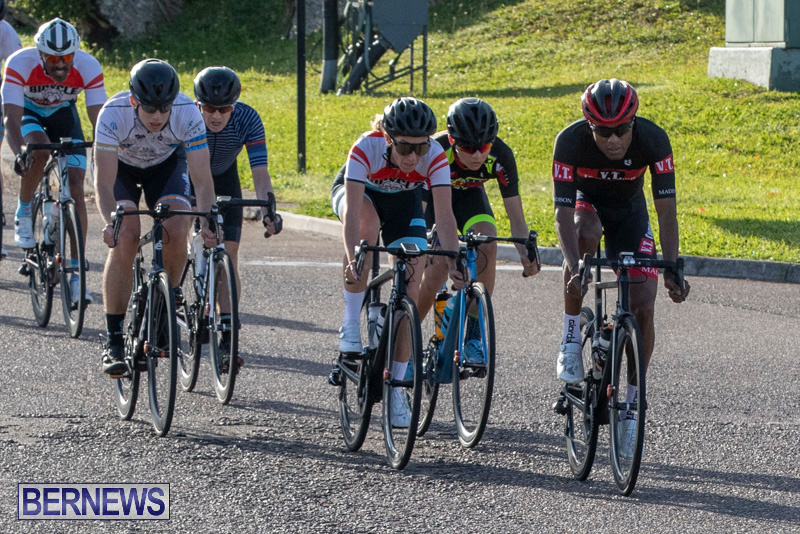 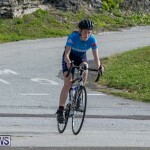 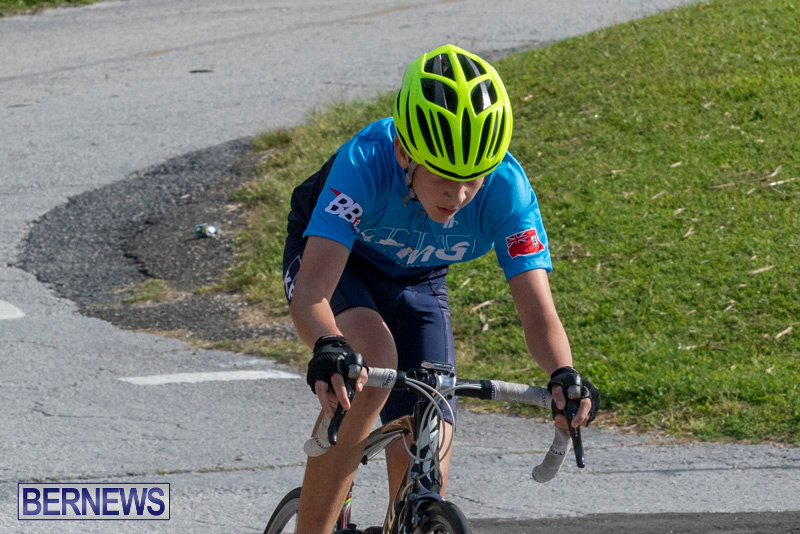 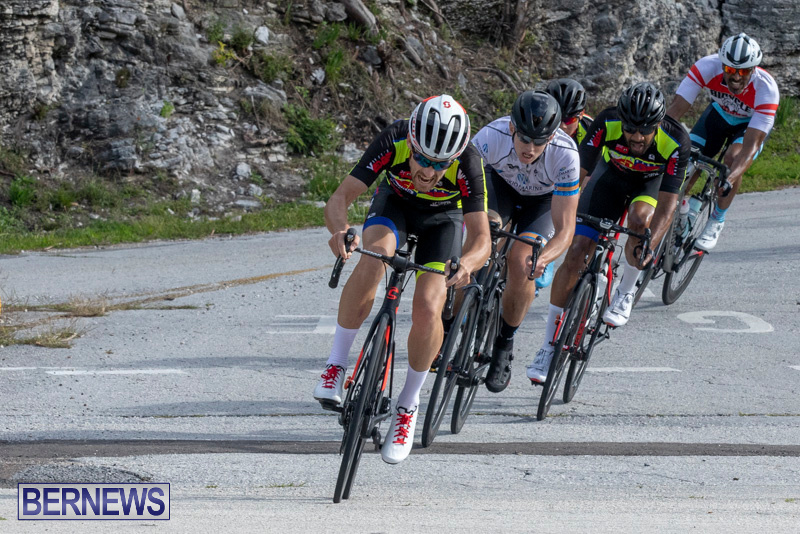 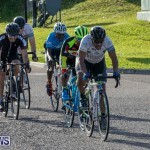 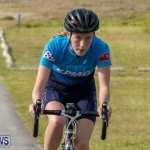 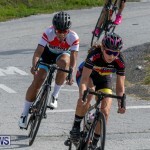 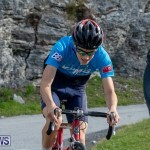 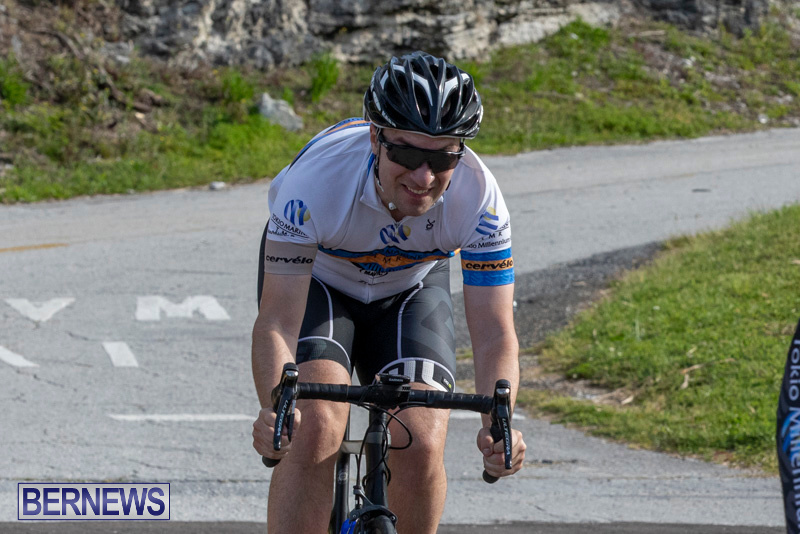 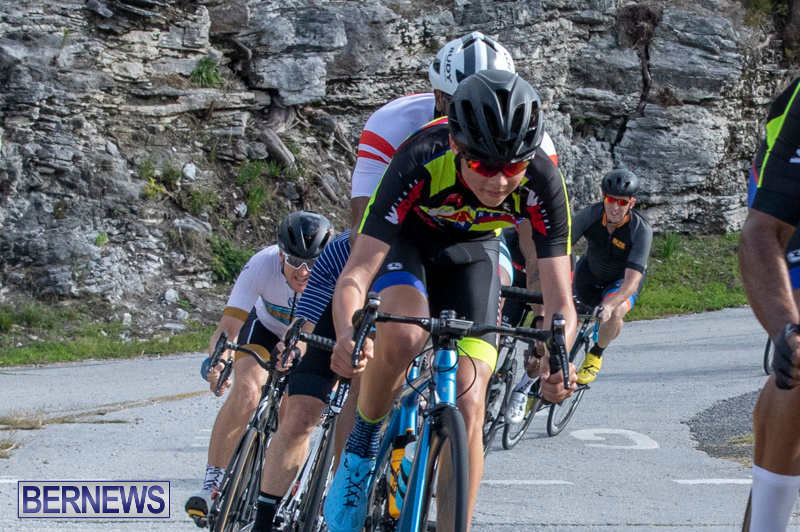 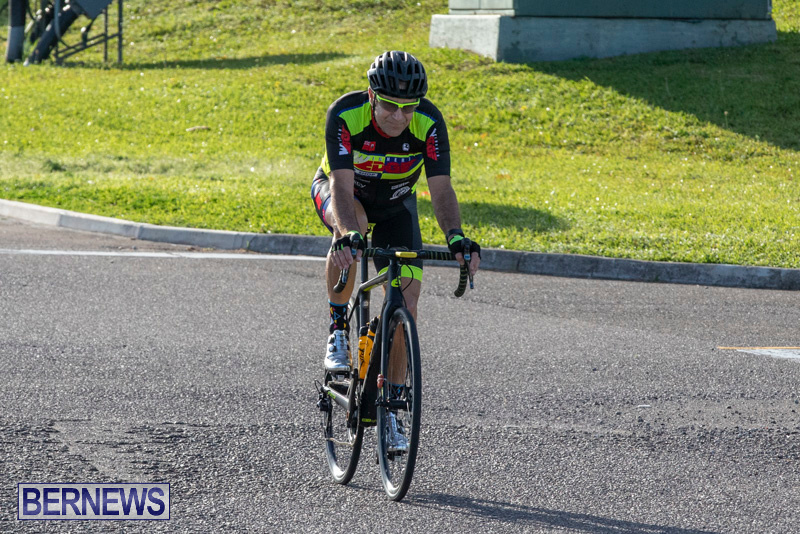 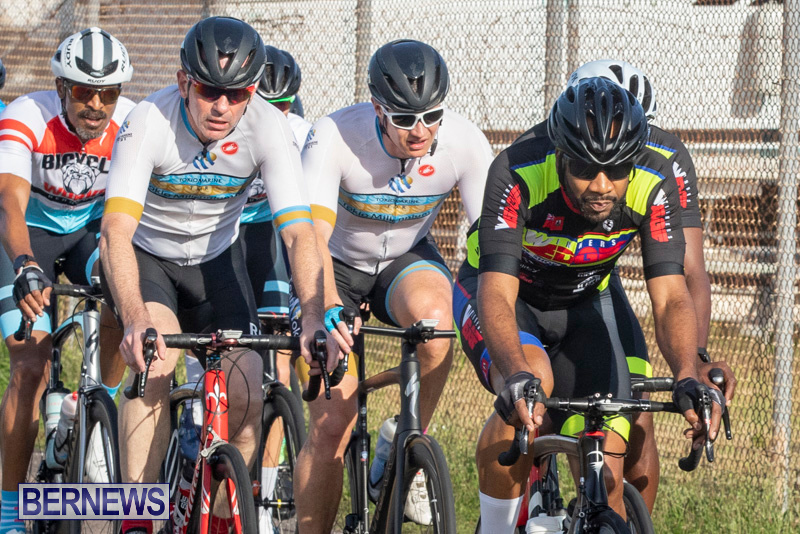 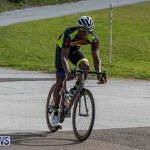 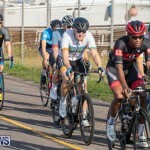 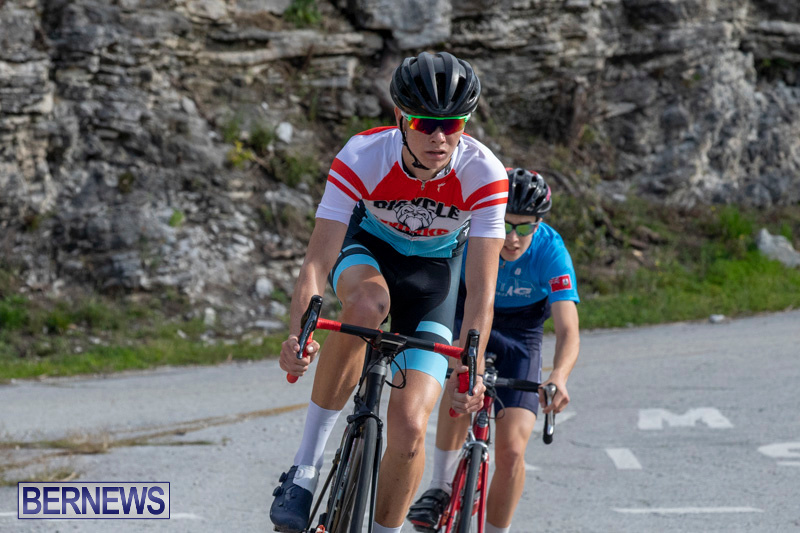 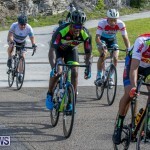 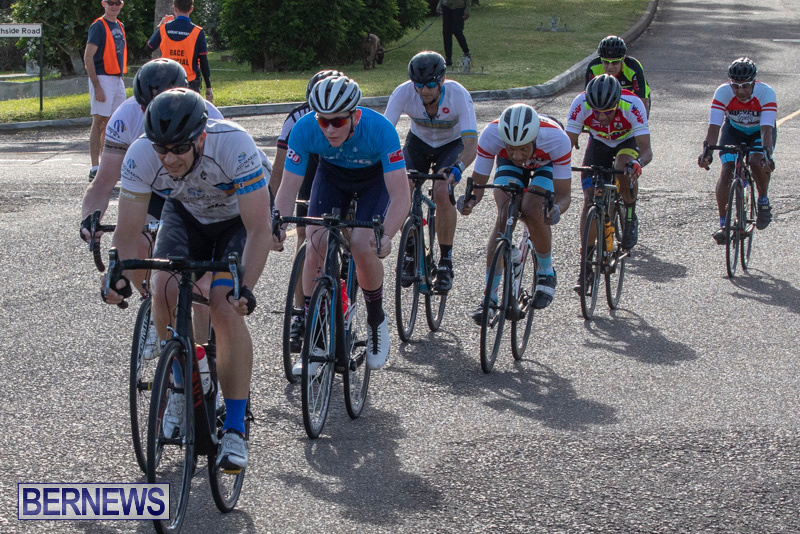 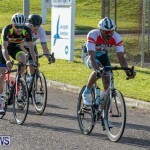 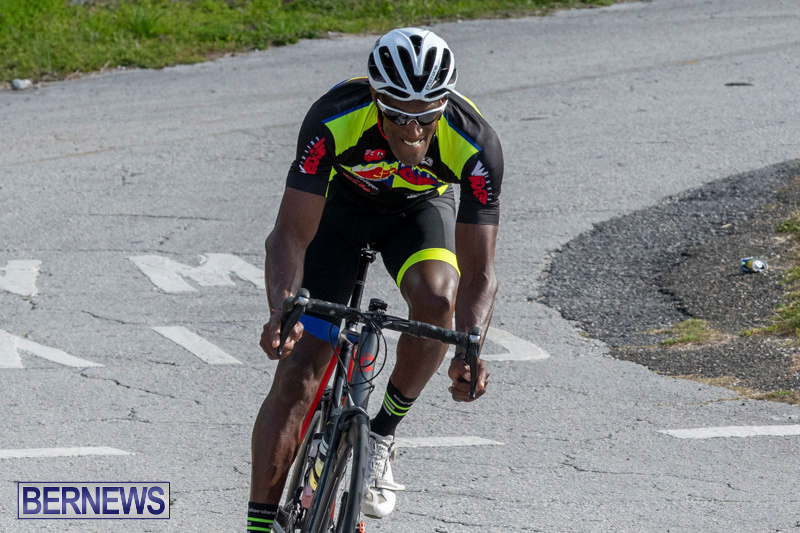 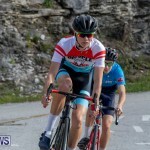 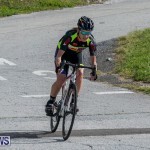 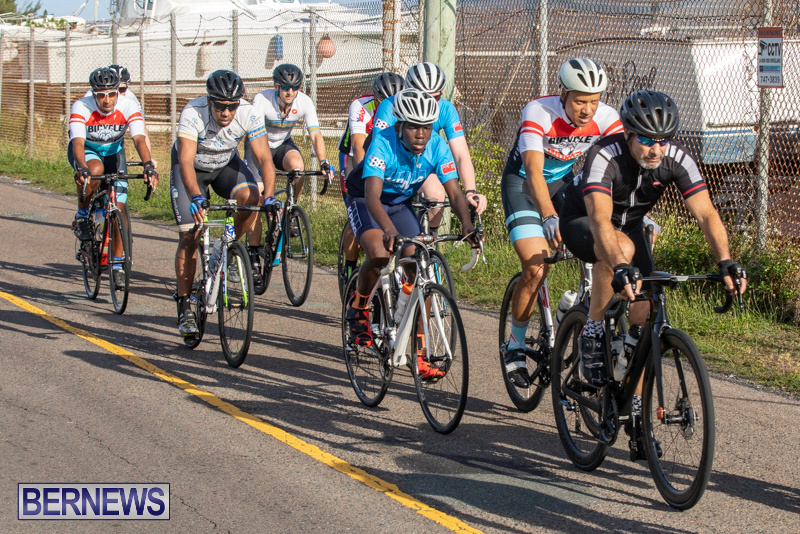 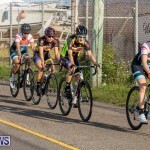 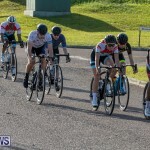 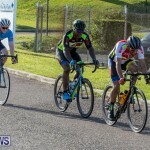 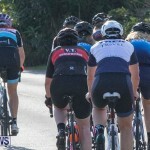 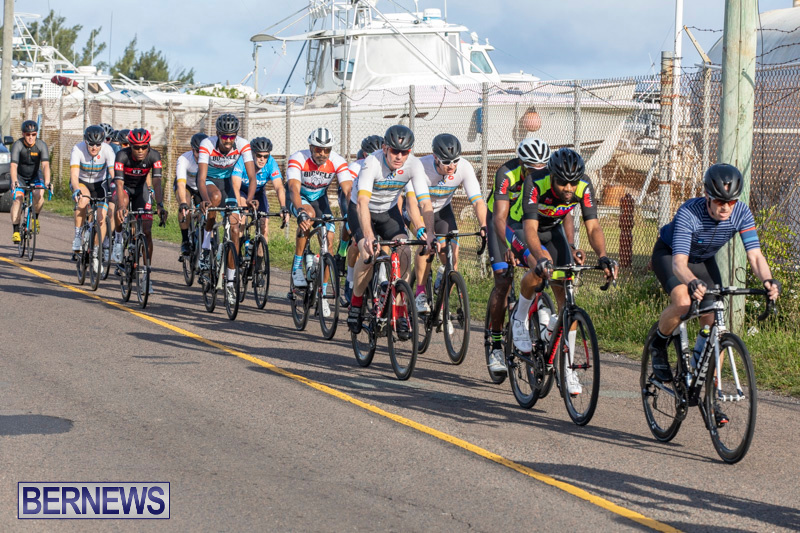 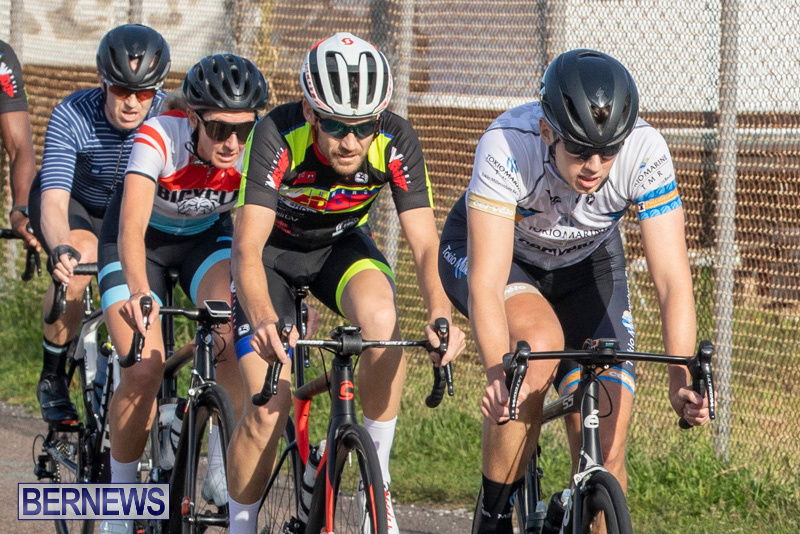 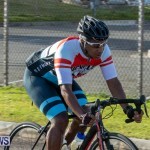 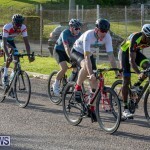 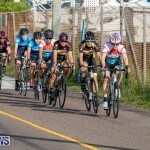 The VT Construction Madison Cycle Road Race was held at Southside, St. David’s this morning [April 7] with the riders doing laps around a course from Clearwater Beach parking lot to the roundabout at St. David’s entrance. 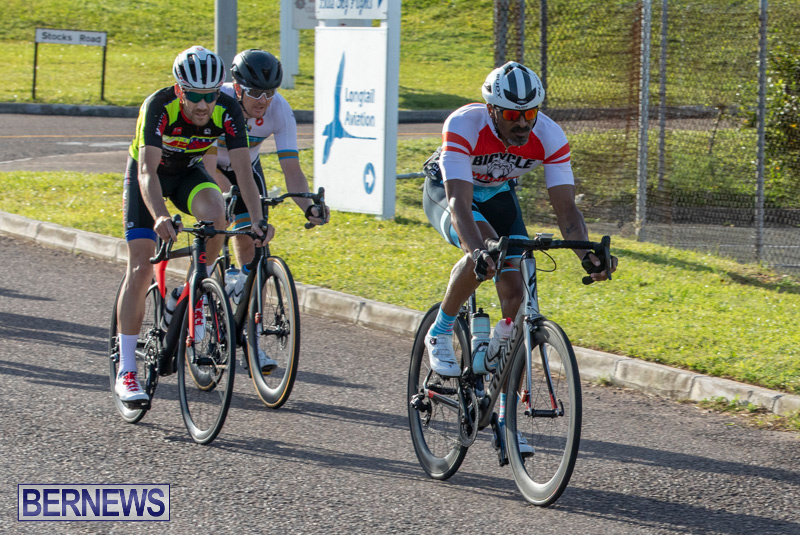 Darren Glasford placed first in the Adult A Class with a time of 1:22:18.321 nudging out Alex Miller who placed second with a time of 1:22:18.675. 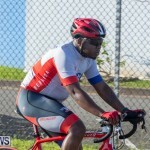 Kwame Curling came third with a time of 1:22:20.686. 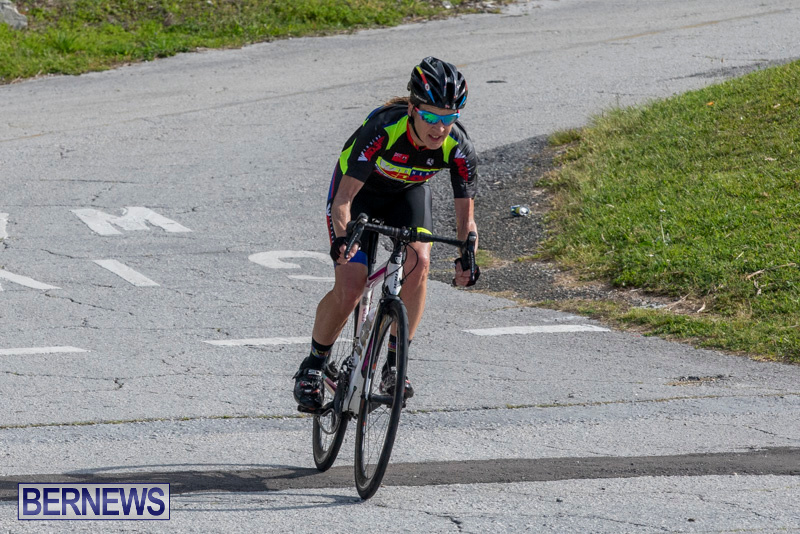 Karen Smith placed first in the Women’s Class with a time of 1:20:17.567. 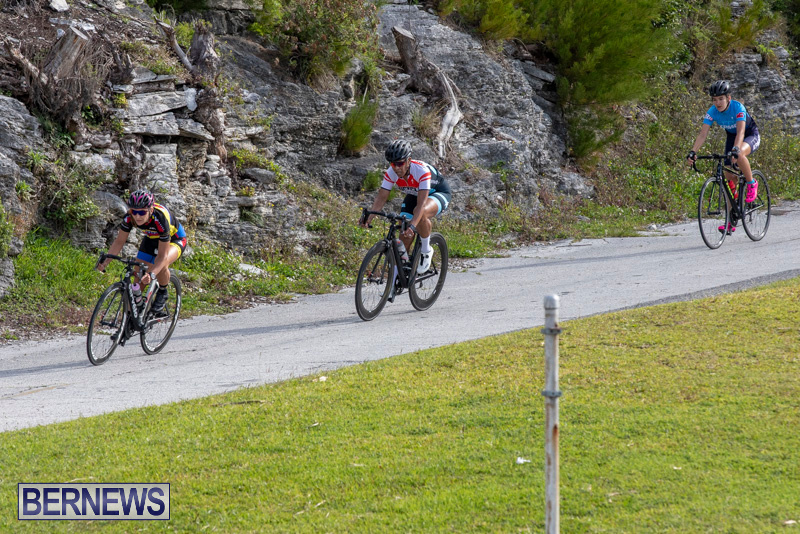 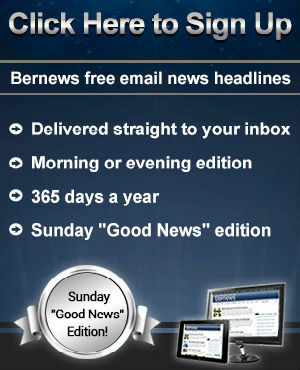 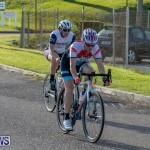 Wenda Roberts came second with a time of 1:24:10.995, while Dianna White placed third with a time of 1:24:12.542. 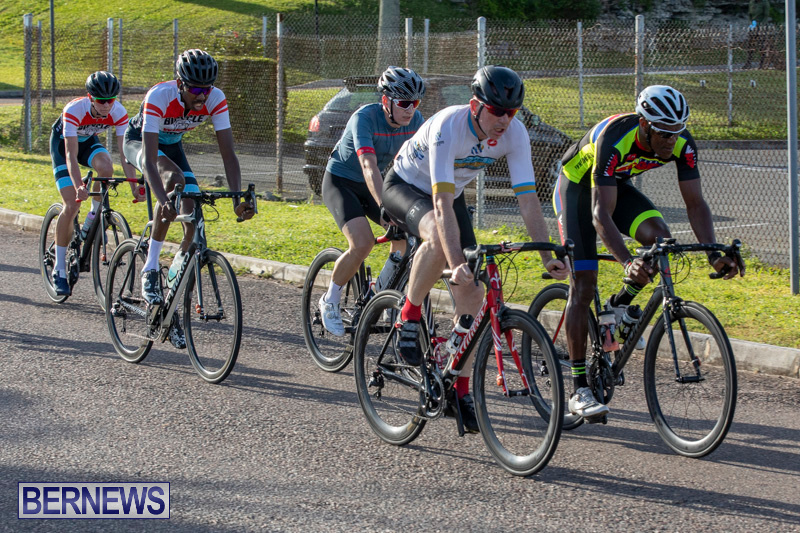 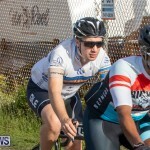 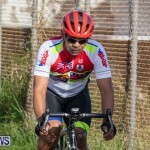 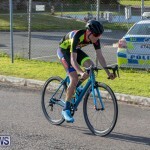 The Adult B Class saw three riders cross the line simultaneously with Alan Mooney placing first in a time of 1:22:18.634. 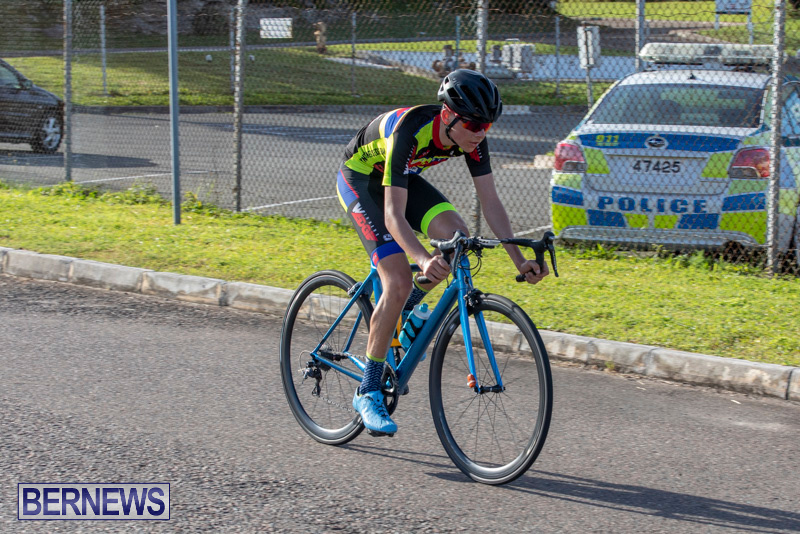 Garth Fleming placed second with a time of 1:22:18.682, while Clifford Roberts came third in a time of 1:22:18.856.